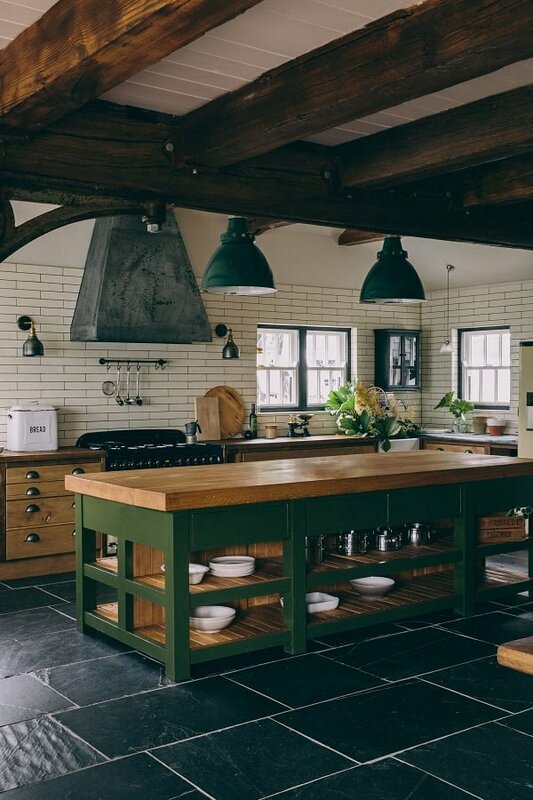 Fancy the farmhouse kitchen decor and want to revamp your kitchen in this style? Here’s the ultimate guide with over 100 stunning ideas. No lack of inspiration here! Updated for 2019. Being a sucker for the aesthetics of the years past, I always appreciate a classic touch on interior designs. The rustic look, the curvy shapes and the warm color tones of individual pieces of decor can completely transform the vibe of a room for me. 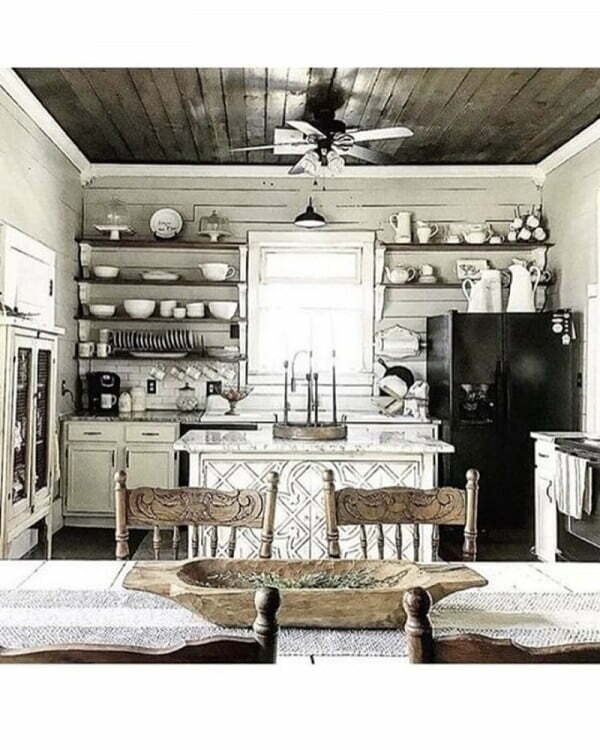 A farmhouse kitchen is the perfect example of such effects. 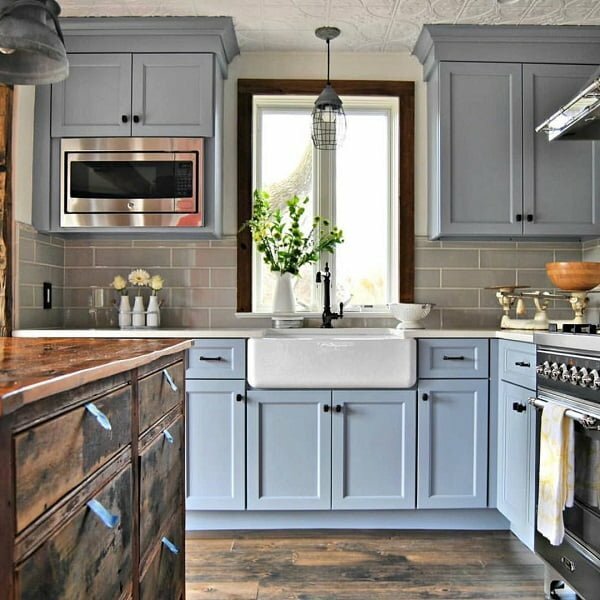 Growing tired of modern kitchen designs, more and more homeowners have taken a liking to the farmhouse appearance. 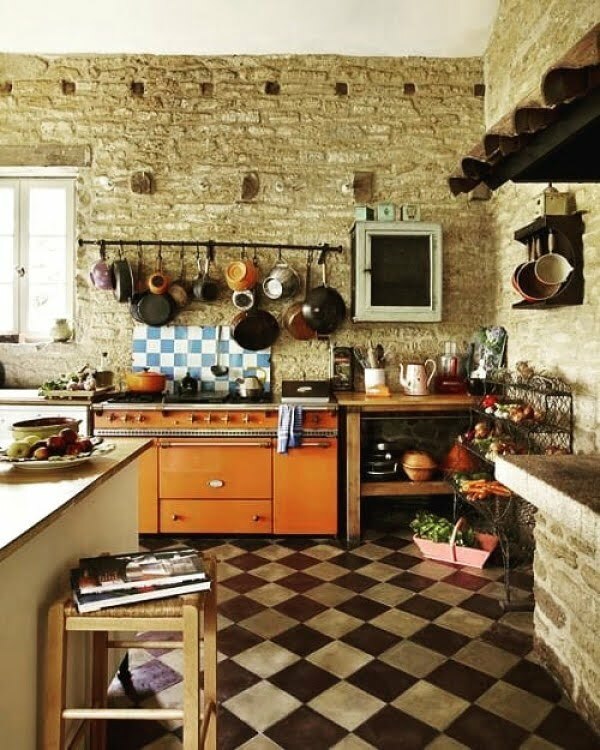 Mimicking the sights of rural households, farmhouse kitchens are designed to match the visual traits of real kitchens in the agricultural setting – or smoke kitchens – back in the Middle Ages. There is an indescribable quality of the look that calls to the beholders. The whole architectural style is defined by the designs, construction and finishing options of several specific fixtures. 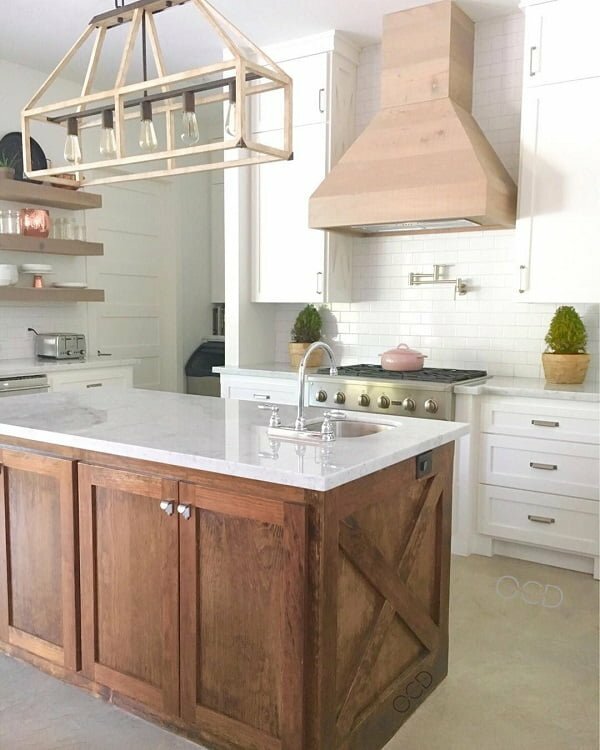 If your kitchen is in want of renovation and the rustic feel of farmhouse design is the aim, these fixtures will be the cornerstones that help turn your cooking space into something else entirely. 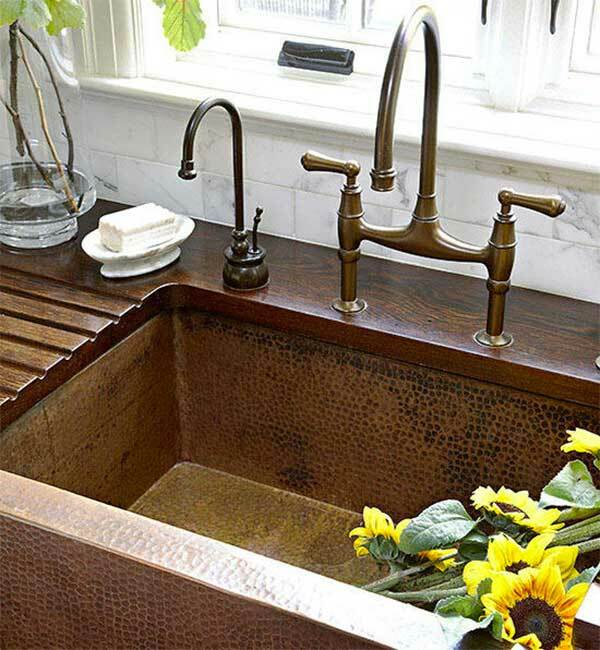 For obvious reasons, a farmhouse sink is an item that can’t be overlooked if a farmhouse style kitchen is desired. As its other name – apron front sink – suggests, the bold and bulky look of the sink creates an emphasis on the countertop space. 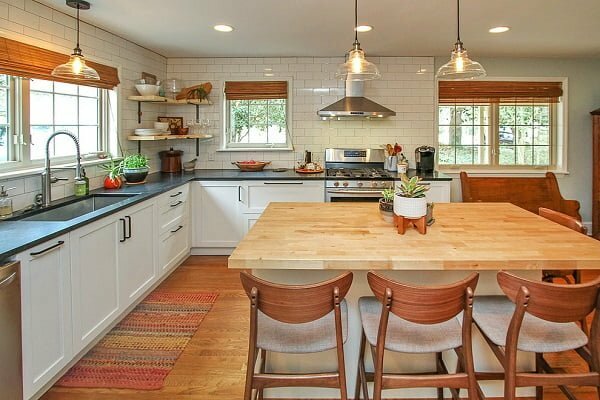 Related: Are Granite Kitchen Countertops Really The Way to Go? 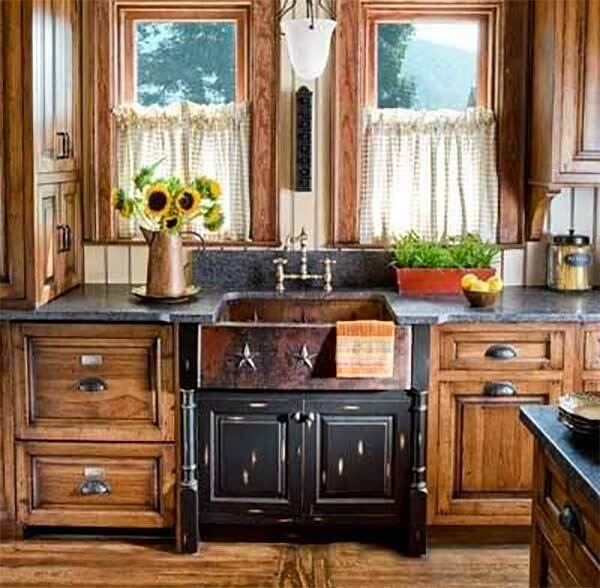 Farmhouse sinks have been very popular in recent years, and the available material options vary greatly. 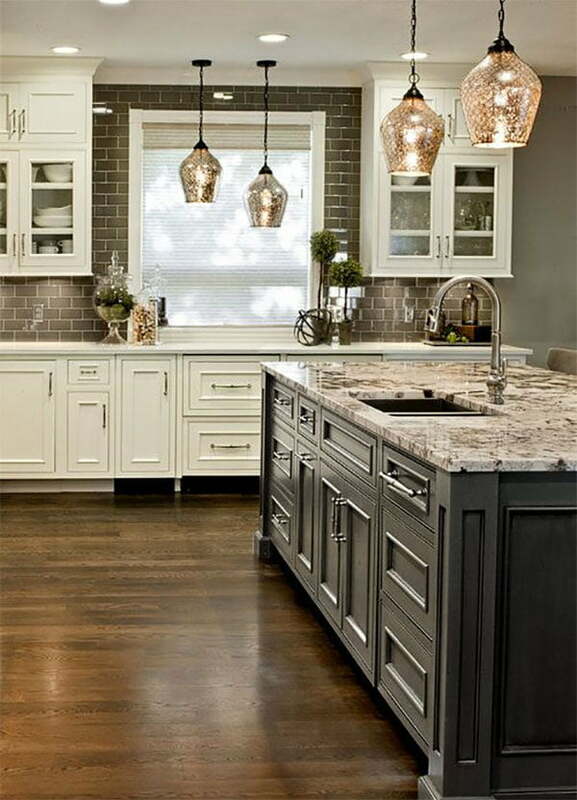 Most of them look great in any kitchen style, especially natural stones like marble, soapstone, etc. The natural patterns, texture and not-too-shiny colors are very much fitting in the setting of a farmhouse. 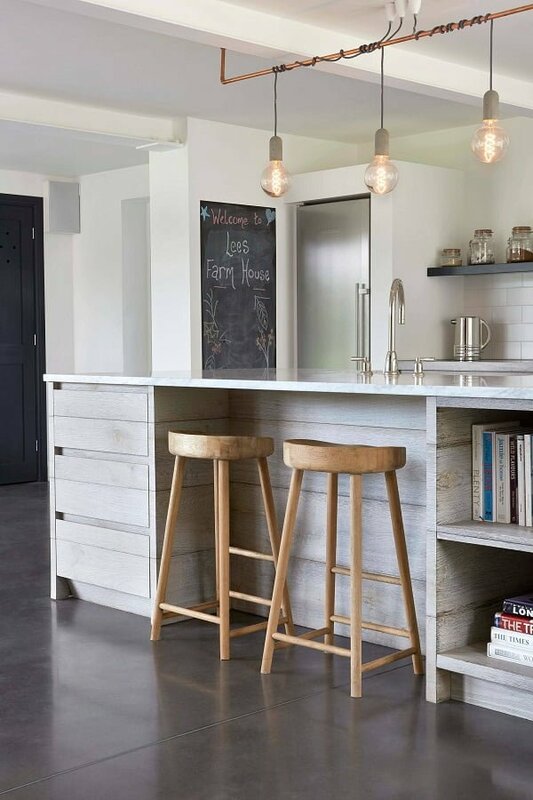 Metallic materials also have their look in a farmhouse kitchen. 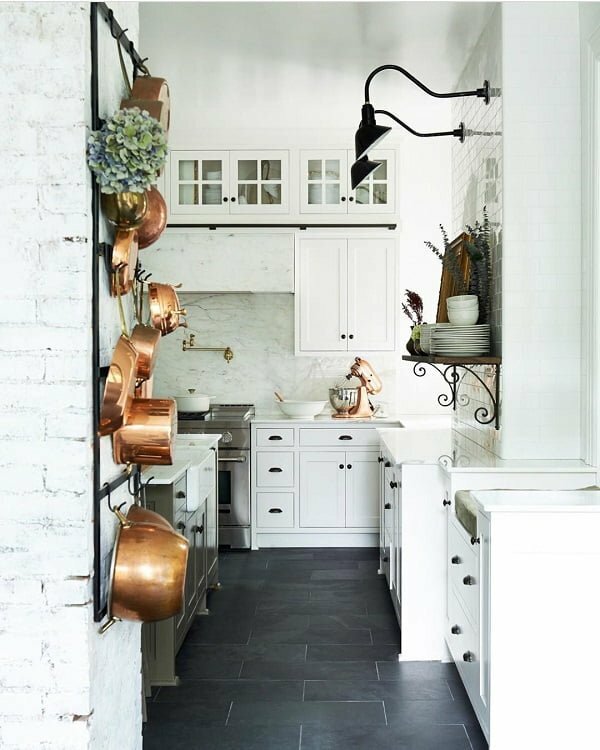 Bronze and copper are no doubt the best options when it comes to classic decor. Brass has a beautiful, warm hue with a gentle sheen. And steel, although more of modern material, can still be a viable choice if used right. The combination of sink and faucet can easily be seen as the core of the kitchen counter. To augment the sink, the tap also needs to be chosen with care. If done correctly, it will undoubtedly stand out just enough to set a focus point for the entire space. Tradition style faucets are of course the target. Depending on your preference, it can be one handled, two-handled, or wall mounted. It doesn’t have to be completely traditional, that is, the functions can stay up-to-date. The focus should be on the characteristics of designs: the convex and concave details, and the colors of the days of yore. 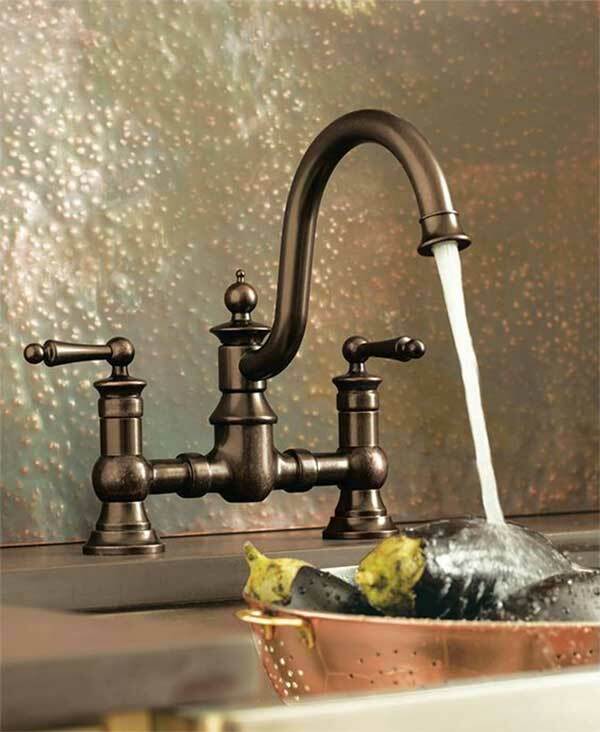 Thus, don’t hesitate to choose a modern kitchen faucet, as long as it comes in a nostalgic style and finishes. 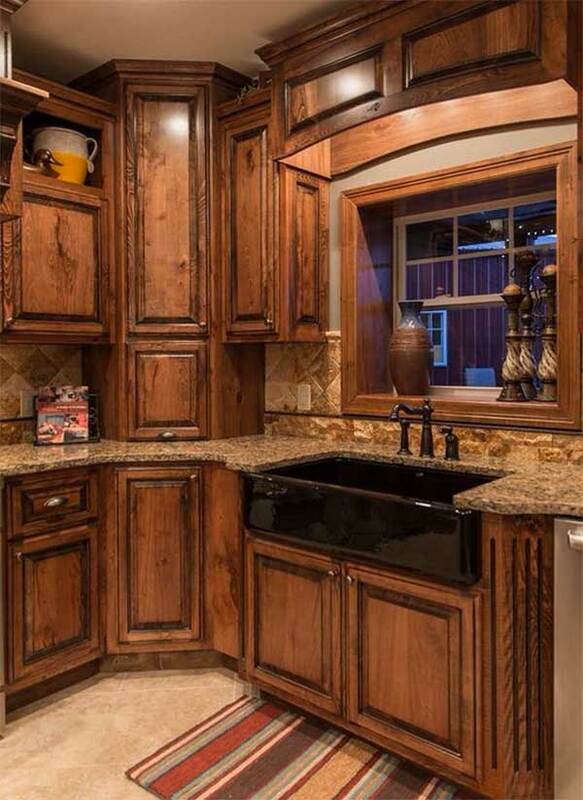 The underlining background for a kitchen is always the cabinets. 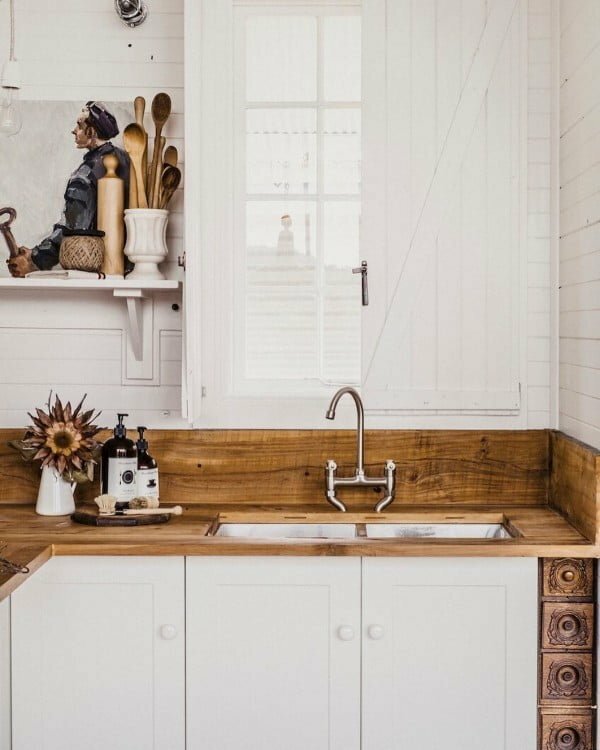 Though they only play a supportive role, the unity of colors and decorative patterns will be the determining factor of the final vibe and will further commend the focal points (the sink, for example) of the whole farmhouse kitchen. 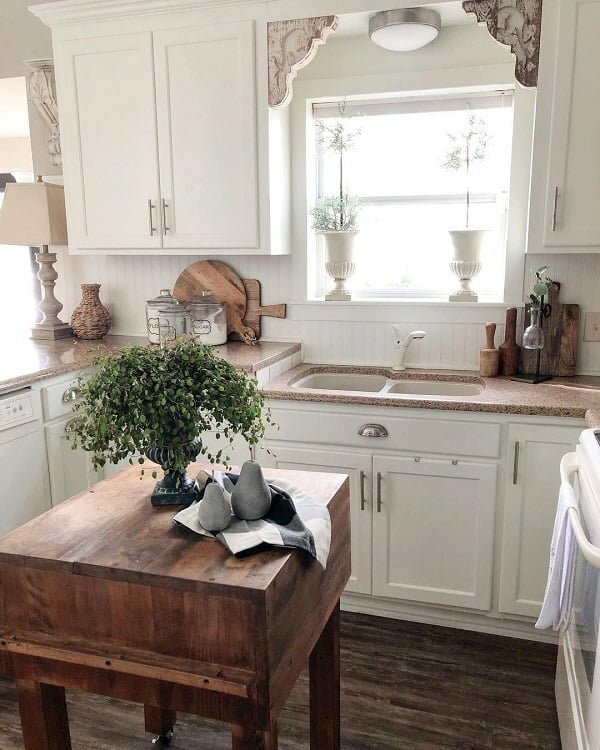 Farmhouse cabinets, unlike modern cabinets which are often built towards a seamless appearance, are decorated with impressive carvings and sylvan colors. With the details to impress, they tend to strike the impression of skilled and attentive craftwork. 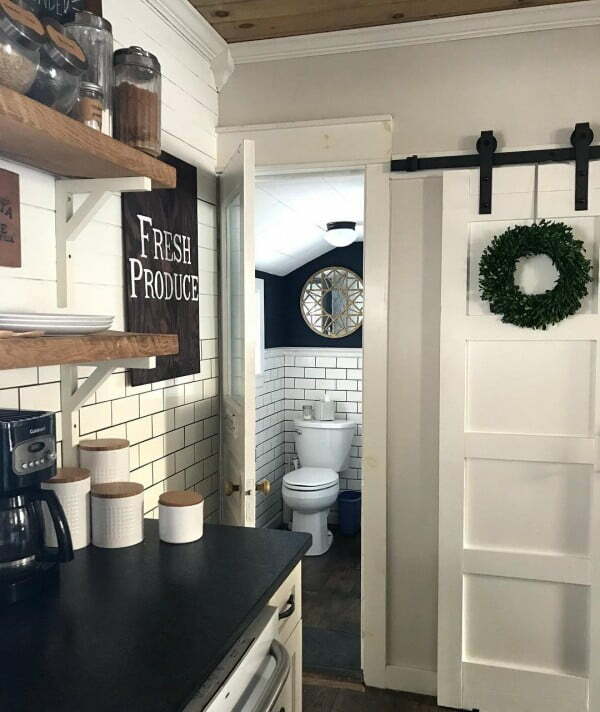 Although we are trying to model a rustic farmhouse kitchen, we do so with functionality in mind. That is to say, we won’t go as far as putting a traditional wood-burning instead of an electric or gas stove in our beloved kitchens. We want an exquisite, well-aged looking room that functions to modern standards and elevates our cooking experience. 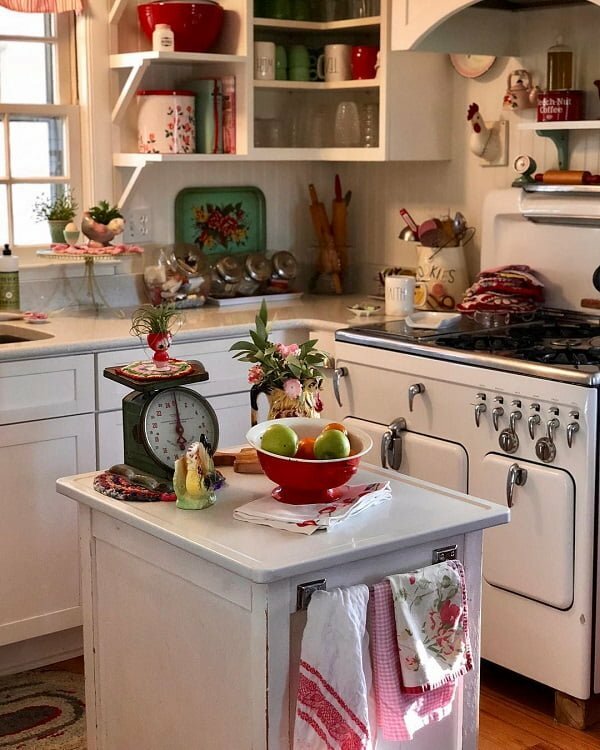 With that in consideration, a set of vintage oven range is exactly what we need to set the room back decades in time while remaining up-to-date useful. Also, keep in mind that as another focal point of the room, its colors should be selected carefully. 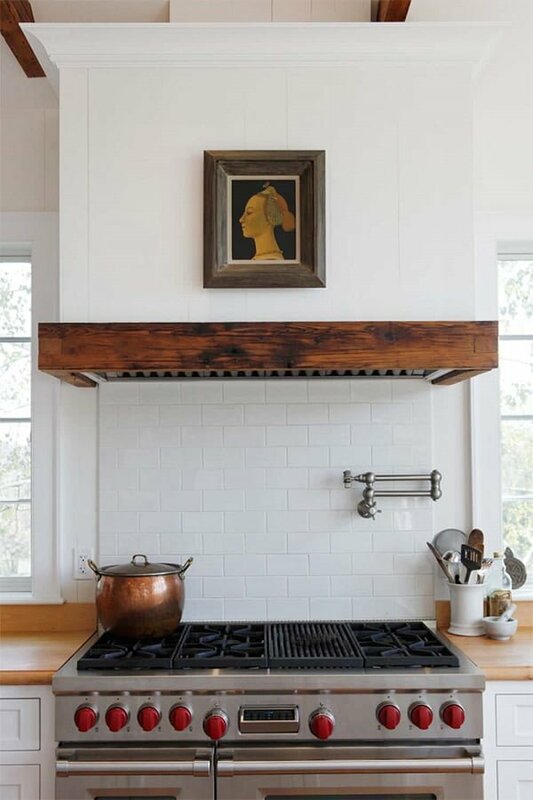 A kitchen is very much incomplete without a range hood for it is an appliance with great utility. 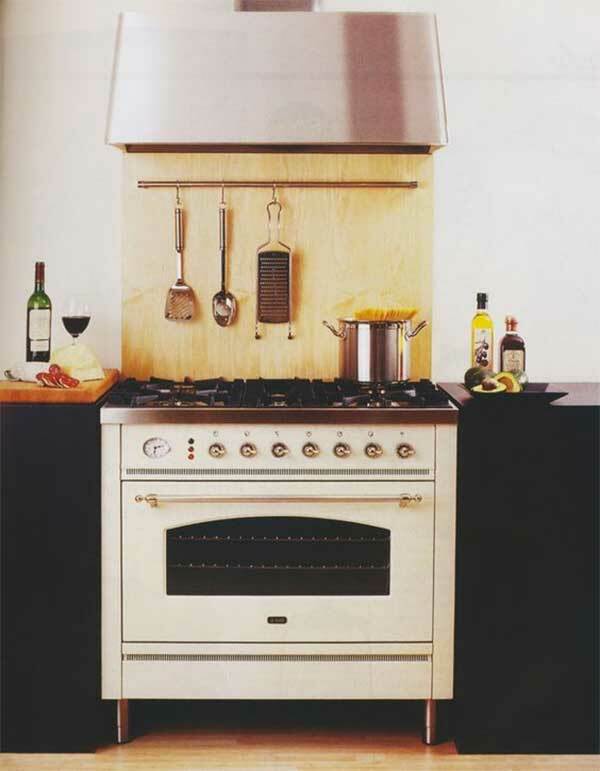 And to go hand in hand with a vintage oven range should be none other than a range hood with wooden duct cover. Now, there are two options. 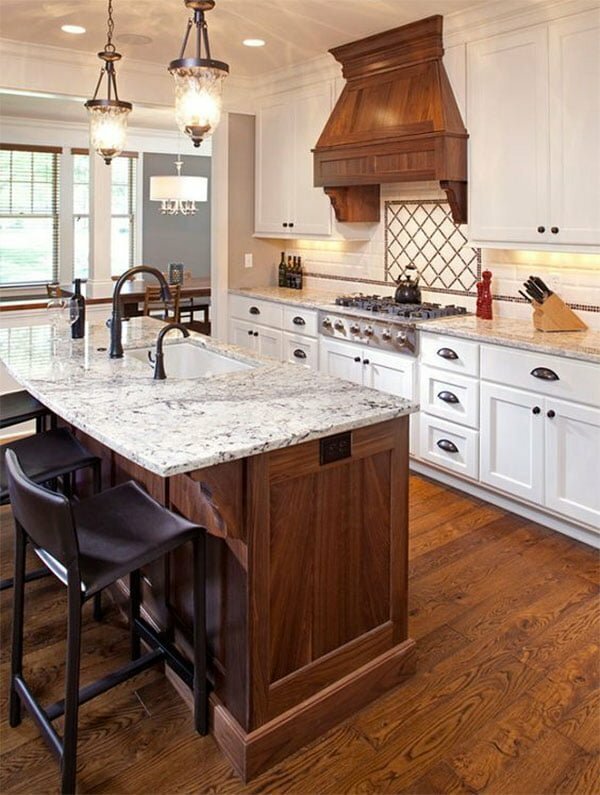 We can either go with an actual wood ducted hood, which matches exceptionally well with a kitchen island or simply an under cabinet hood with a wooden cover. Admittedly, the cover alone doesn’t serve any particular purpose, function-wise. The whole idea of having one is to make it seem like the kitchen has a chimney. 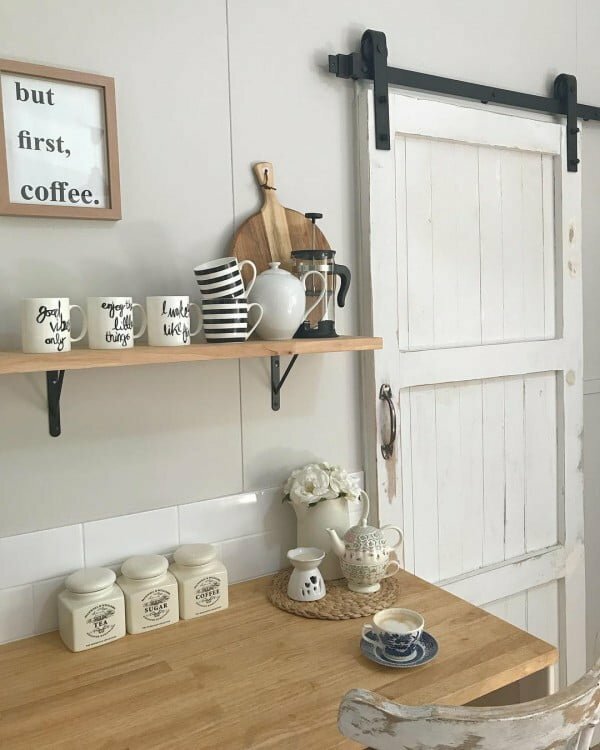 It’s a lovely touch and one of my personal favorite farmhouse kitchen details. 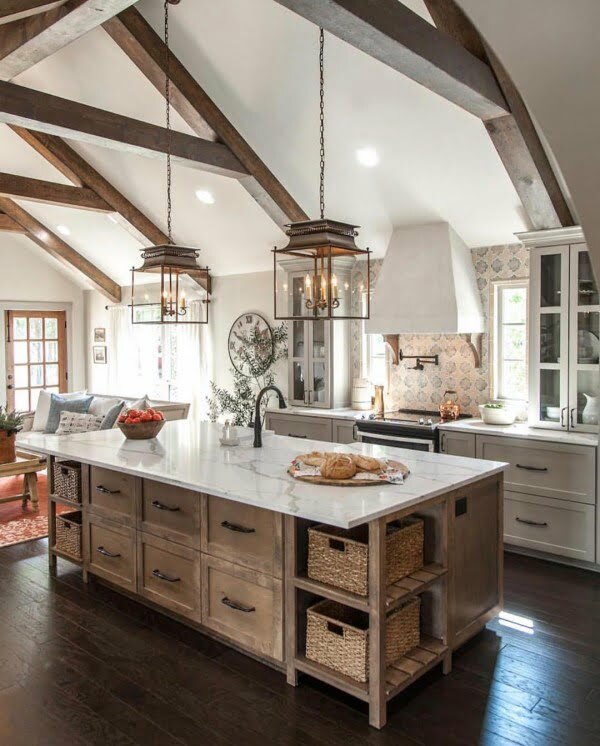 In an actual traditional farmhouse kitchen, the island would not be a feature of practicality simply because the room didn’t have much space. It is more of an addition to the architectural style. A very welcomed addition, I might add. 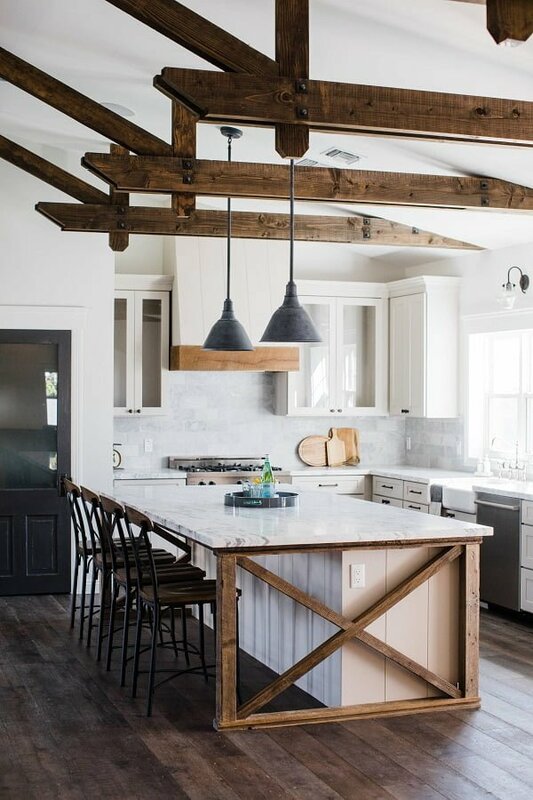 With a few alterations, not only can an island contribute to the rustic image we’re going for but it can also deliver a certain level of sophistication and elegance to the room. Any interior design enthusiast knows that farmhouse lighting is a substantial contributing factor in creating the mood that envelops a space. An atmospheric lighting system is needed to complete the farmhouse look. Clearly, the visuals of the luminaire are essential. However, the hue of the light is the more crucial element. 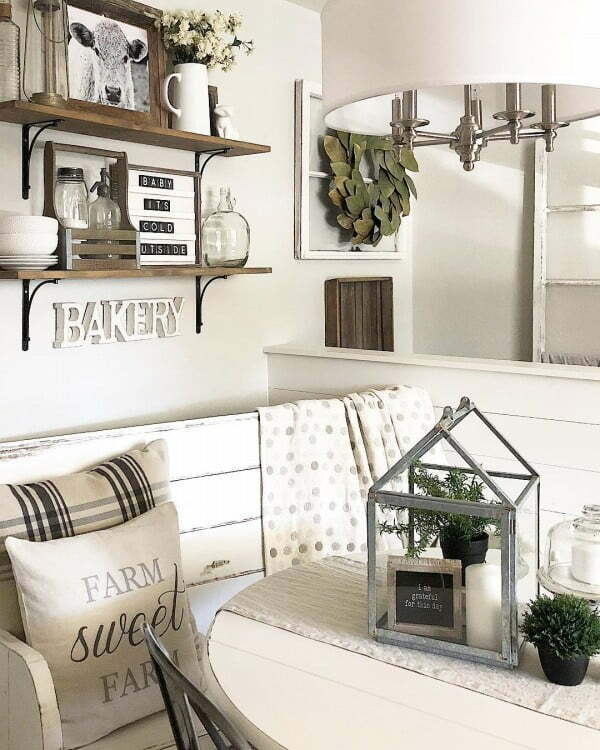 To create the warm, tranquil atmosphere of a farmhouse, a cool white light should be restricted to some areas. It is the shade of modern times, the times of advancements. Instead, what we want is the pleasant glow and the orangey hue of warm white light – the color that resembles the heat and the glare of the most popular sources of light there were: fire and heated wire filaments. In short, a kitchen makes a home complete. 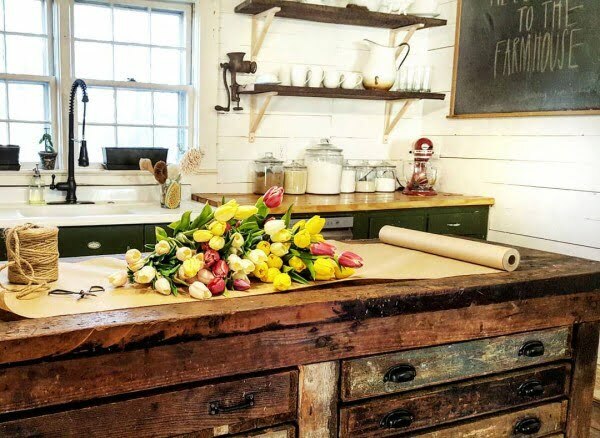 Designing your kitchen in a farmhouse style is an intriguing idea. 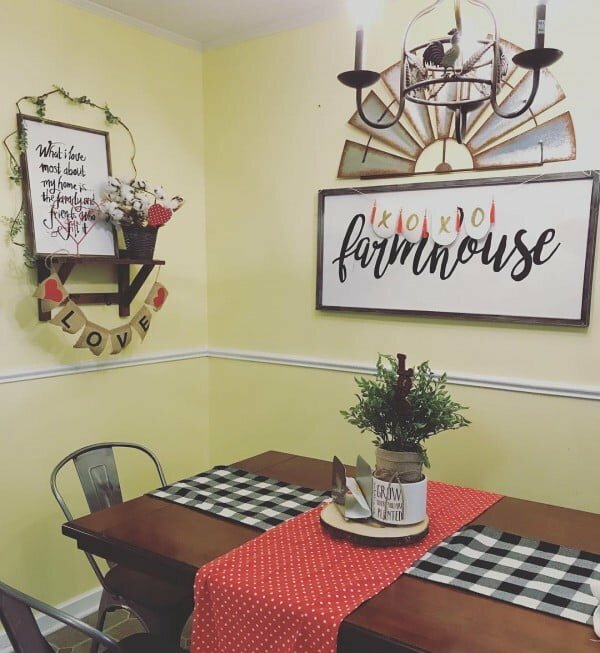 The term farmhouse implies typical rustic ideas. 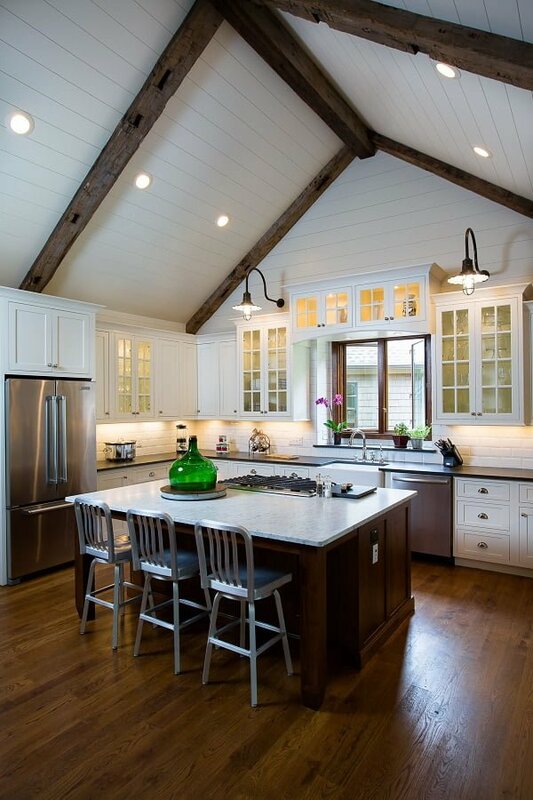 So, traditional furniture or wooden beam as the source of lighting amounts to excellent farmhouse application. 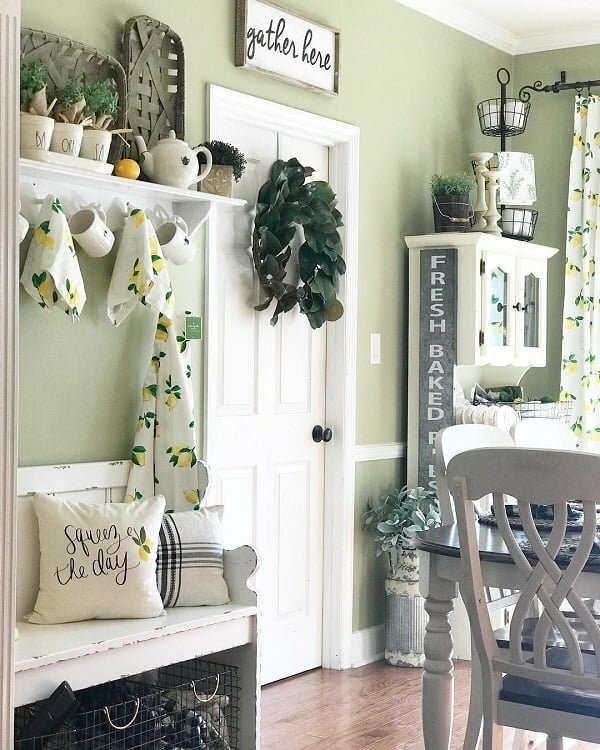 Below are 100 terrific farmhouse kitchen decor ideas that you can copy to transform your kitchen. 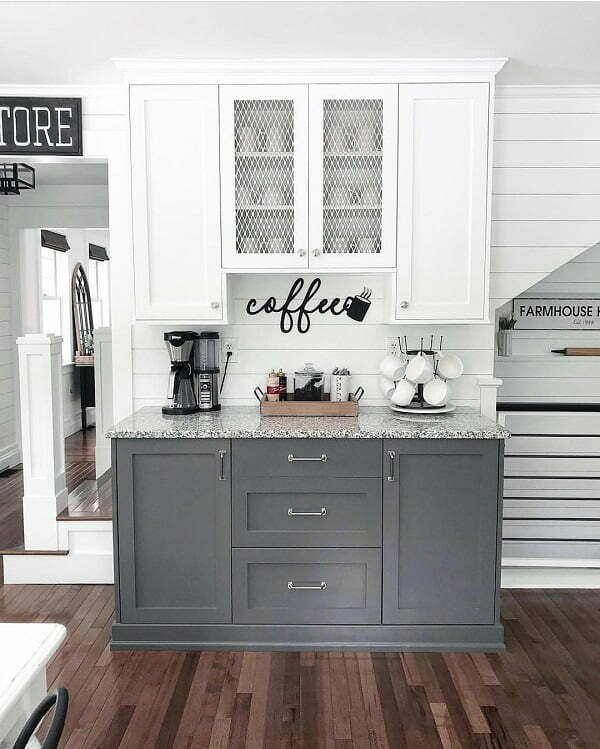 This farmhouse furniture is excellent for the kitchen. It’s not only cute in appearance, but it is also easy to clean. The table is spacious enough, and thus an excellent choice for families. 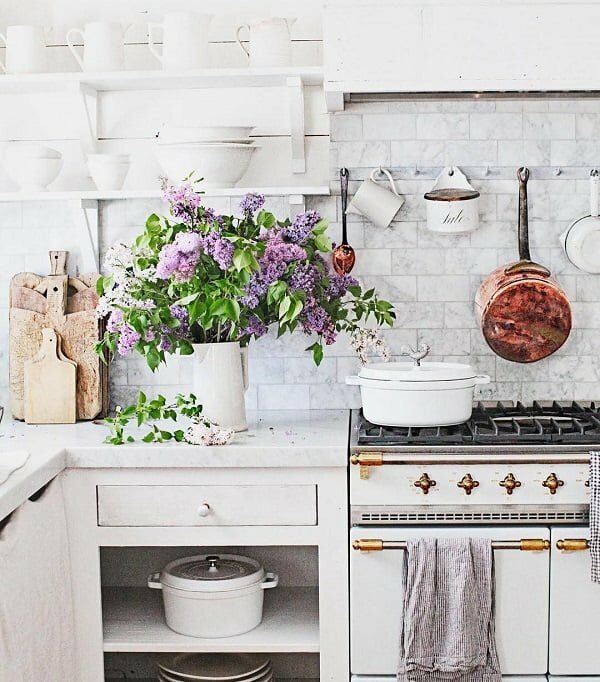 You’ll never go wrong with a whitish decorated kitchen. 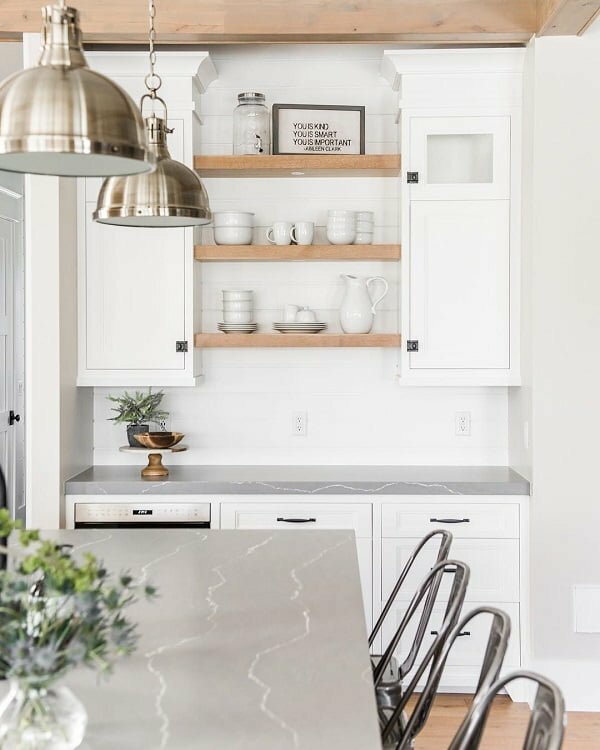 If you are keen on small details and you want your kitchen looking neat always, you can have both the cabinets and the shelves painted white. This simple technique is to make the kitchen door unique and adventurers. The rolling hardware is a simple way of expressing love in the kitchen. The overall look of the door is a vintage one. Also, notice the subtle use of kitchen wall art on the subway tile. With a partly black painted wall, the stationing of a rectangular medium-sized antique makes your kitchen’s dining space perfect. You can fix two or more seats depending on the size of your family. 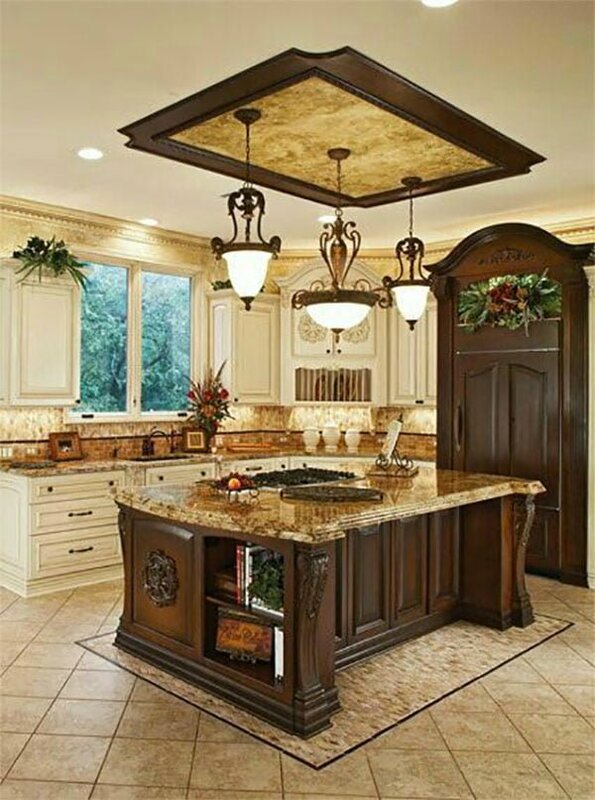 This design is one of the unique and attractive kitchen decorations. 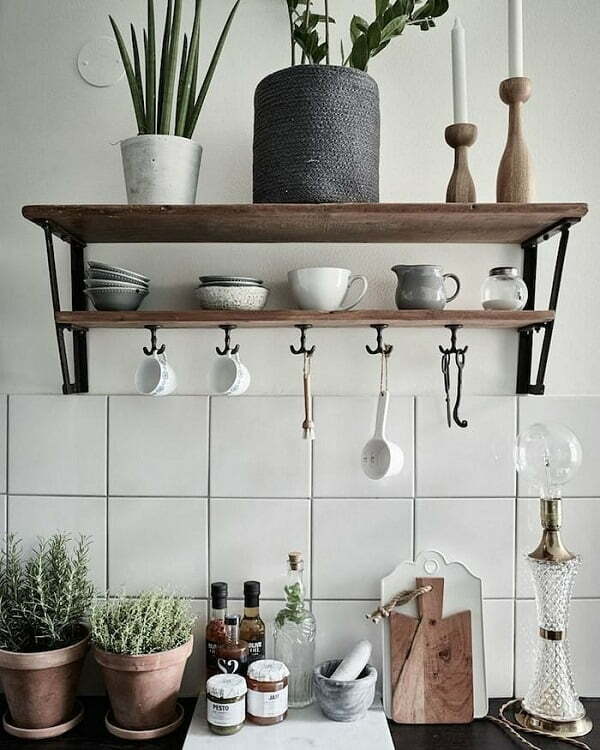 You can hang your cups and pans on the utensil hangers. 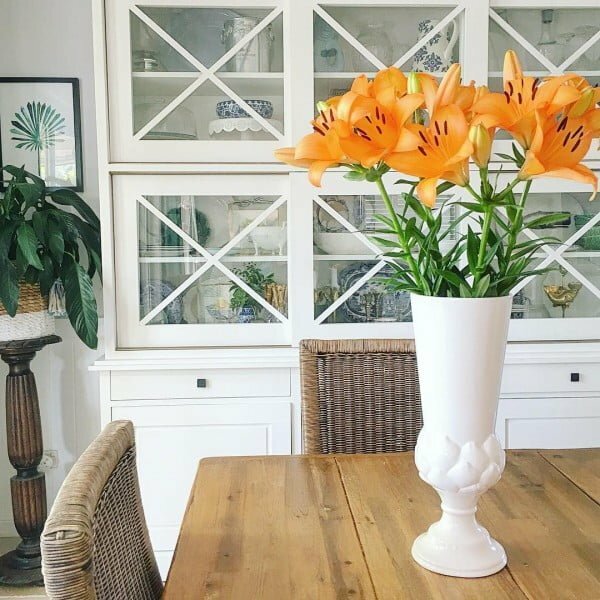 You’ll never miss the farmhouse point if you place a clear flower pot in the middle of the kitchen table. If you are looking for a way to prolong the lives of your flowers and make them smell much better in the kitchen, you should soak them in vodka. The smell is very pleasing. If you have clear glass jars for storing your spice, flavors, and other ingredients, they will look much more helpful if labeled. 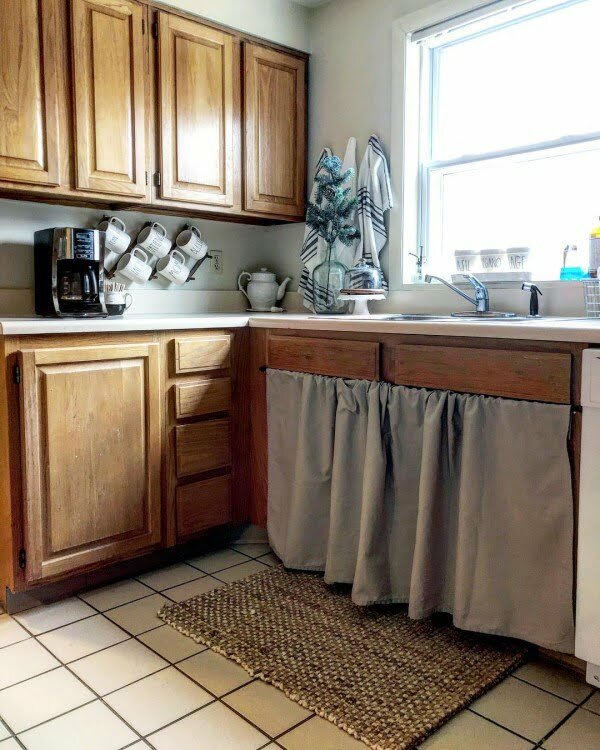 With creative maneuvering, you can transform your woven baskets into ideal storage sets to be inserted as drawers under your main kitchen table. You can have your ceramic jars for tea, coffee, and sugar engraved with signs indicating the contents. This design is old school but very classic if used in a modern a kitchen. 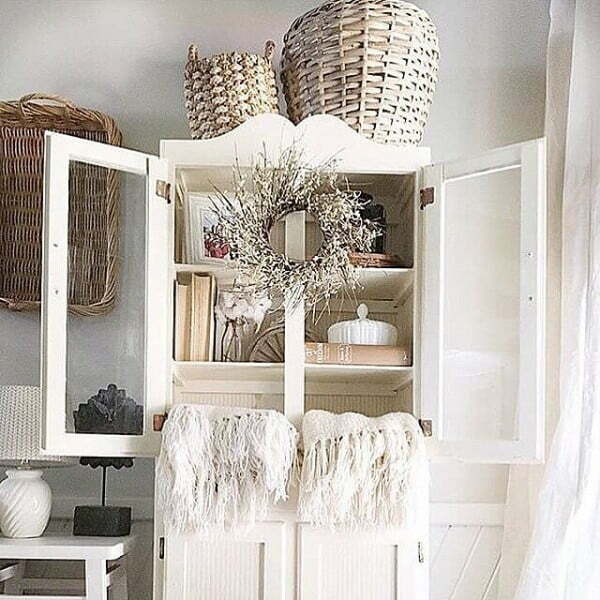 The cupboard can be used to store your kitchenware. The beauty of antique furniture set is that they can be employed in any kitchen. The presentation of the natural set is beautiful and classic. 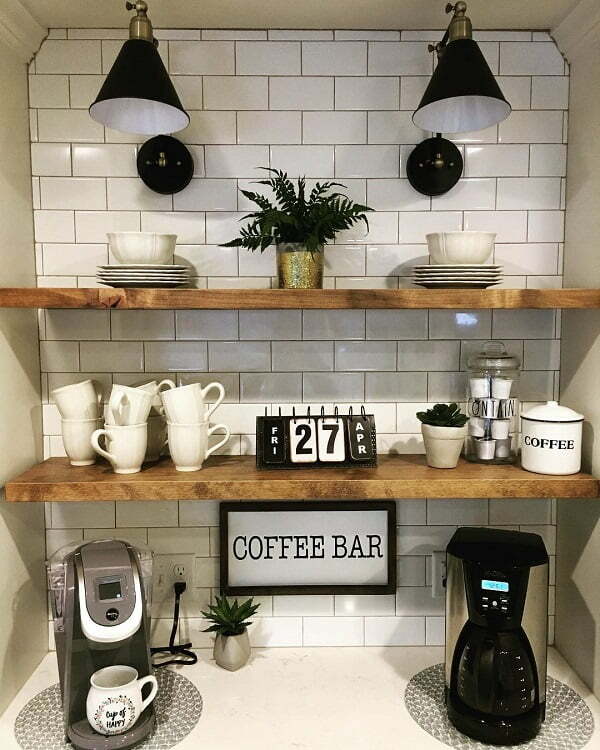 The family pictures look good in the kitchen just like in the living room. You can place them on the kitchen shelves to inspire when dining as a family. 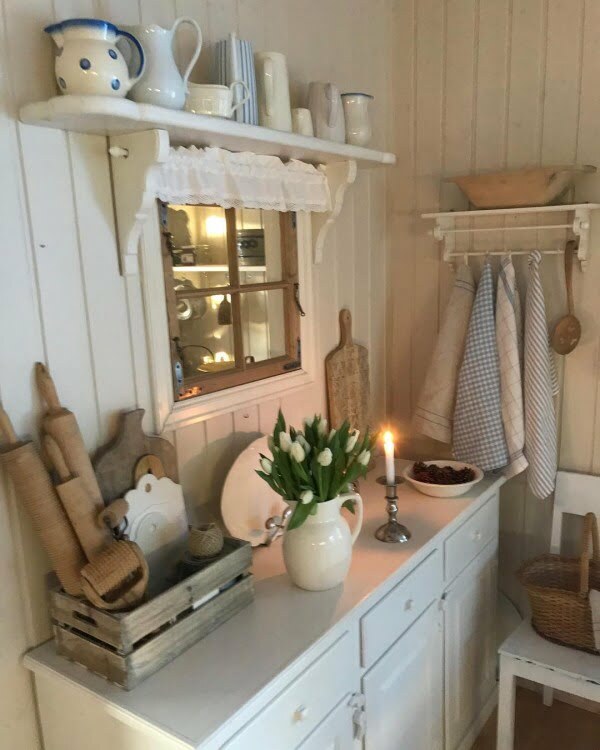 This idea is to make your kitchen appear old school but cozy. The lanterns are meant to inspire you when in the kitchen. They also offer some decorative touch. 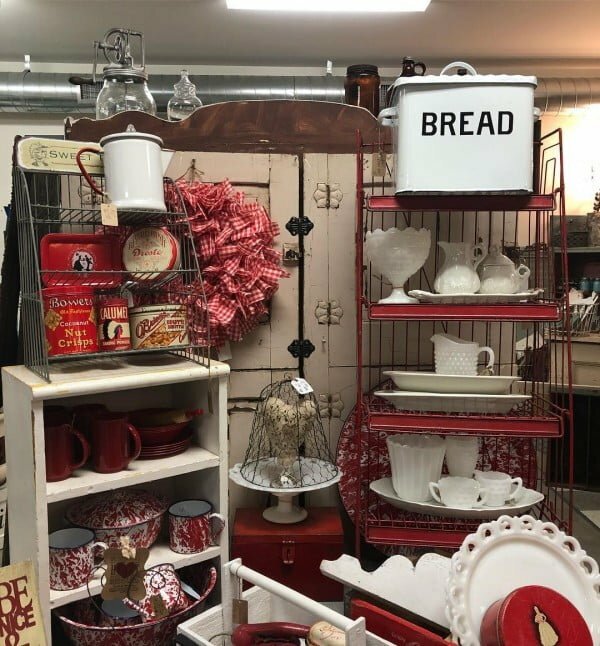 These pieces are best for the dining section of the kitchen as they offer you comfort and class. They are attractive and give your kitchen an authentic farmhouse experience. 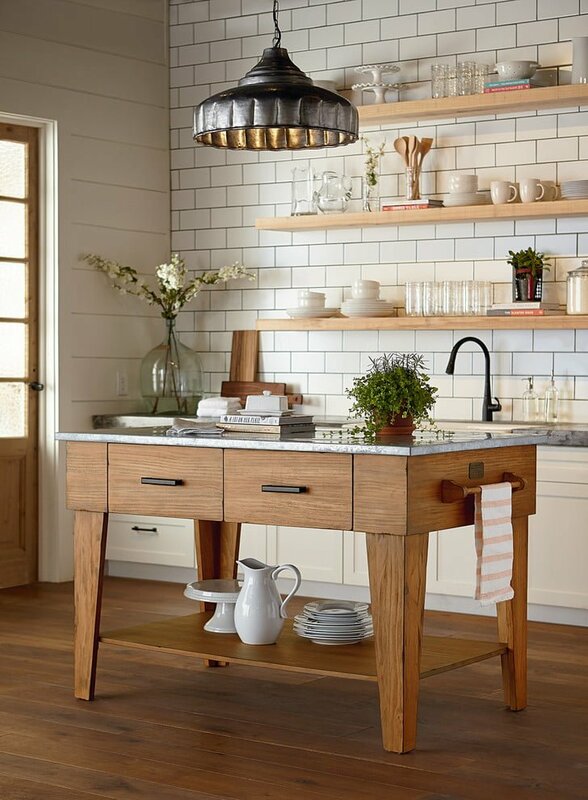 Related: Are Wood Butcher-Block Kitchen Countertops Ideal on a Budget? In most cases, you are expected to time yourself in the kitchen. The hanging clock helps you to manage your time, and also act as farmhouse decorations. 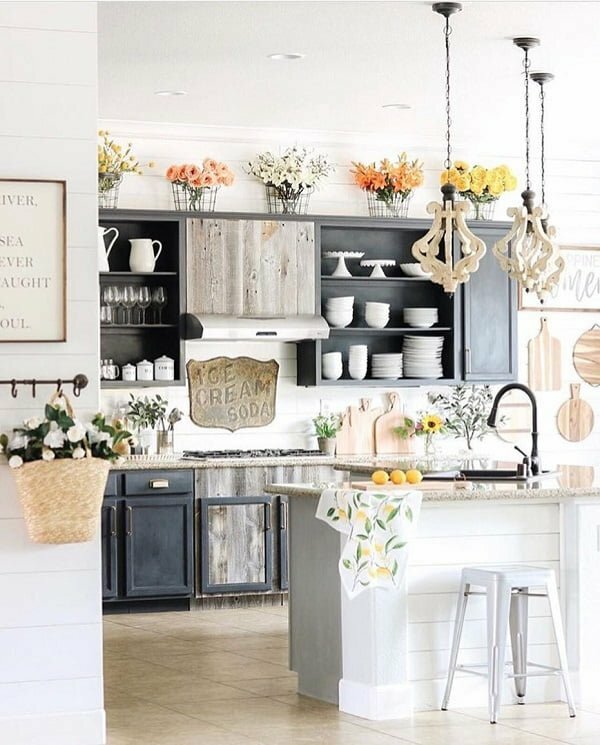 This setup is designed to give your entire kitchen a farmhouse touch. All the dining pieces (table, stools, and armchairs) are made from natural wood. If your dining tables lack attractions, you could do with the paperwhites and the carpet. 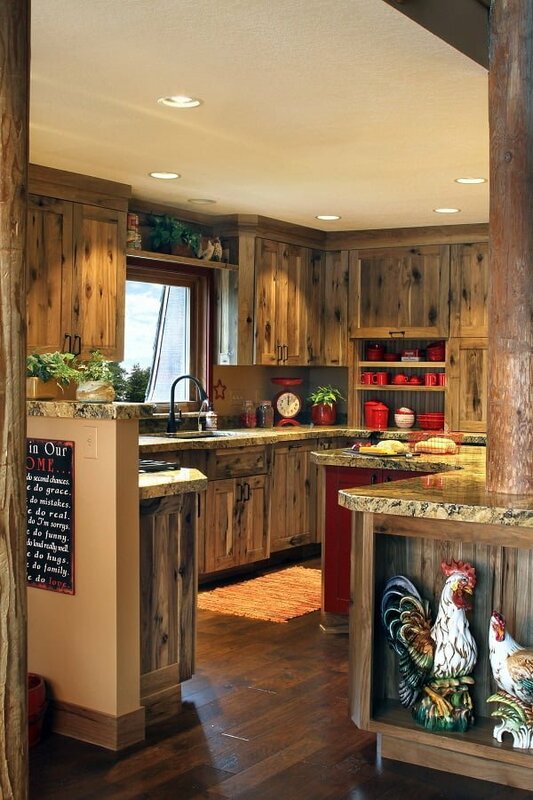 They are meant to add a farmhouse feel to your contemporary kitchen. 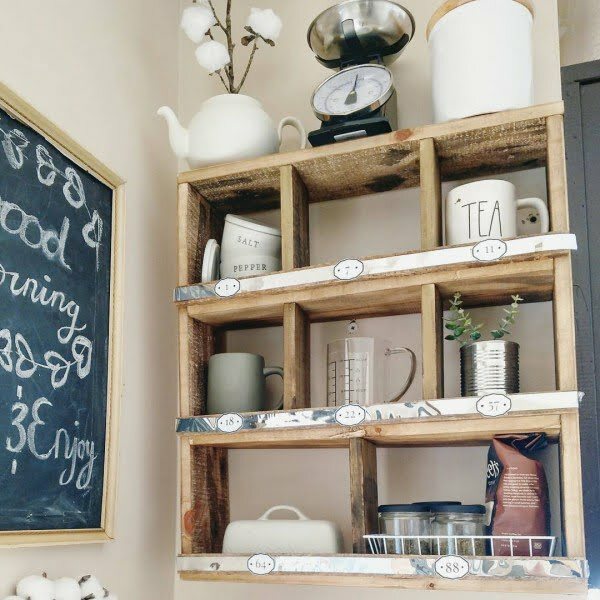 The simplest way to incorporate a farmhouse idea into your kitchen is by putting up love messages strategically. The kitchen is an entry point into the house, and thus should appear so. There is always beauty in having some of your ceramics engraved with personalized messages. Common accessories to customize, include the mugs and bowls. The chalkboard is both decor and a kind reminder of what the kitchen is all about. The piece is meant to promote the physical look of your kitchen, and to some extent, the chalkboard makes the ambiance so inviting. 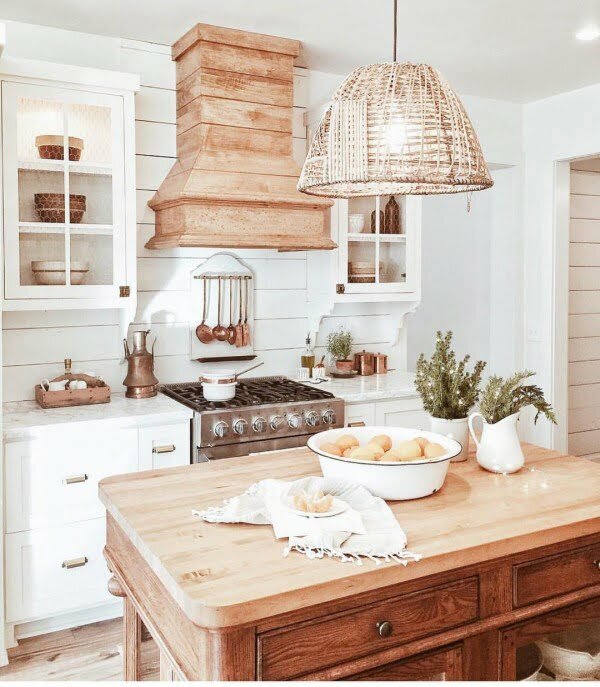 The accessory is meant to make the kitchen look natural—and with a farmhouse touch. 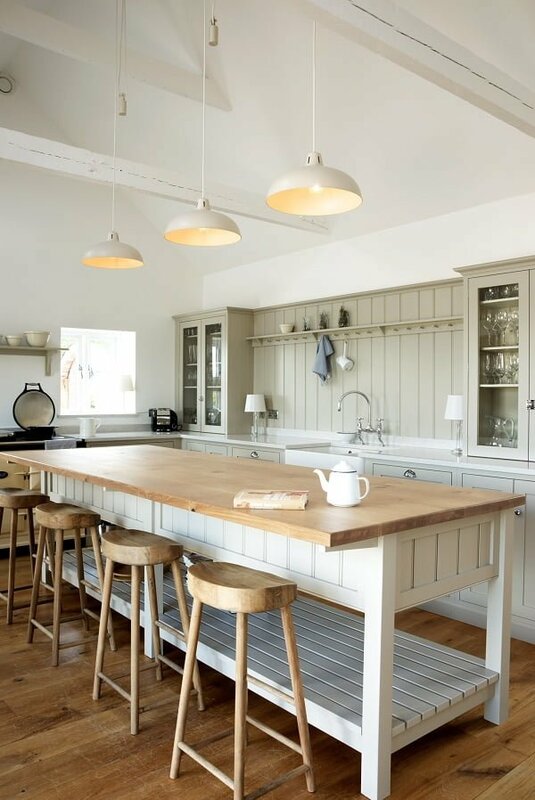 This idea is vintage but classic at the same time, and the decor is great for the contemporary kitchen. The bowls and cups look pretty when placed on the open shelves. The shelves should be wooden with metallic support. The best way to position your huge window is adjacent to the sink. This is to ensure that you get the best natural lighting when washing the dishes. This setting is ideal for a simple kitchen. 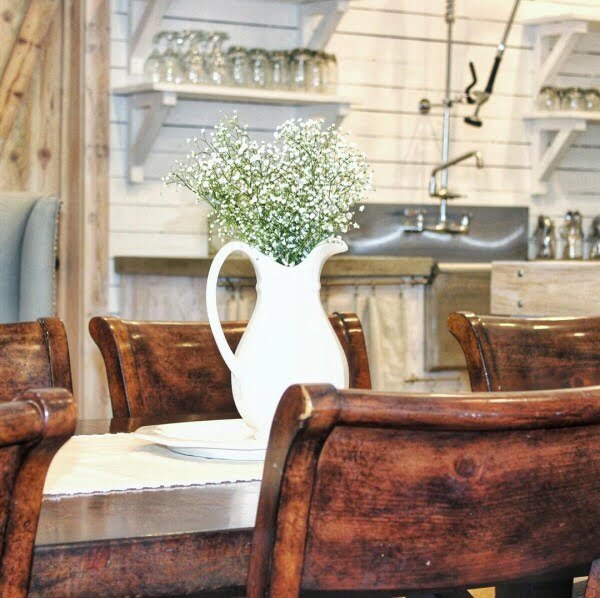 The baby’s breath is meant to brighten the natural-looking dining set and the entire kitchen. The seats are meant to add class and style to your dining set. The chairs are not only beautiful but also unique; thus convenient for the modern kitchen. 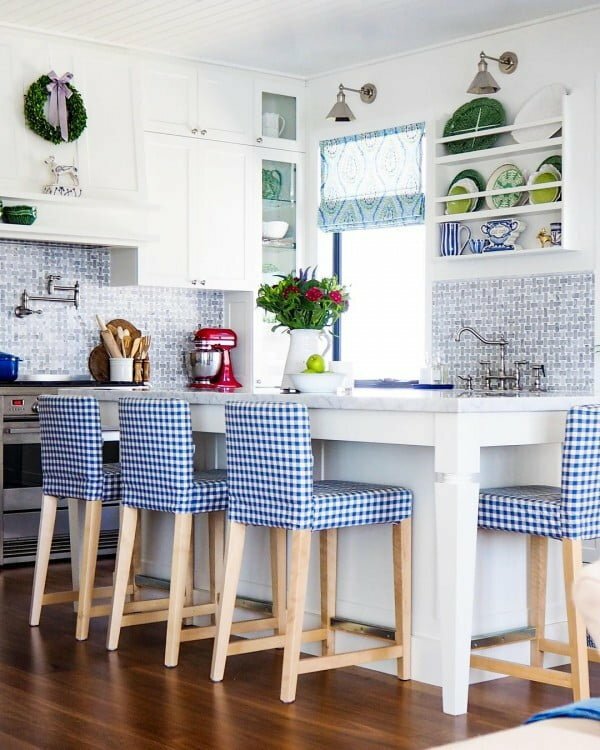 If you want to give your kitchen a beach-like look, the backsplash tiles are a good choice. 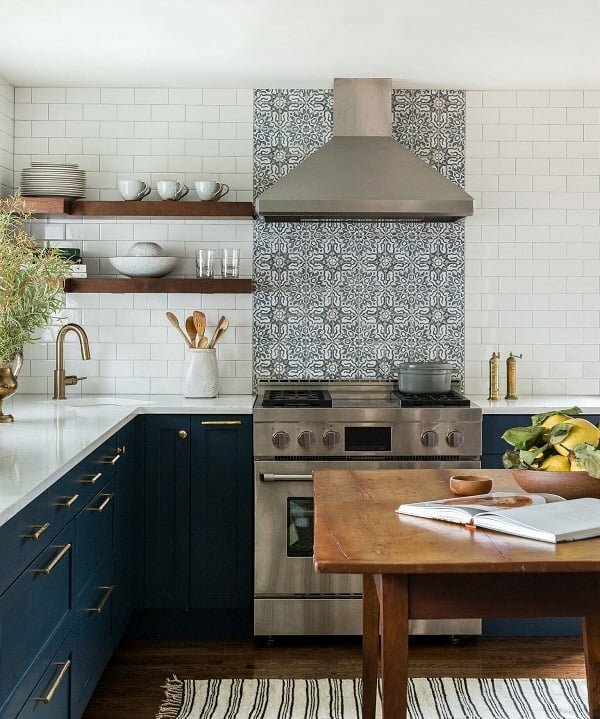 The tiles should cover your entire kitchen space for uniformity reasons. 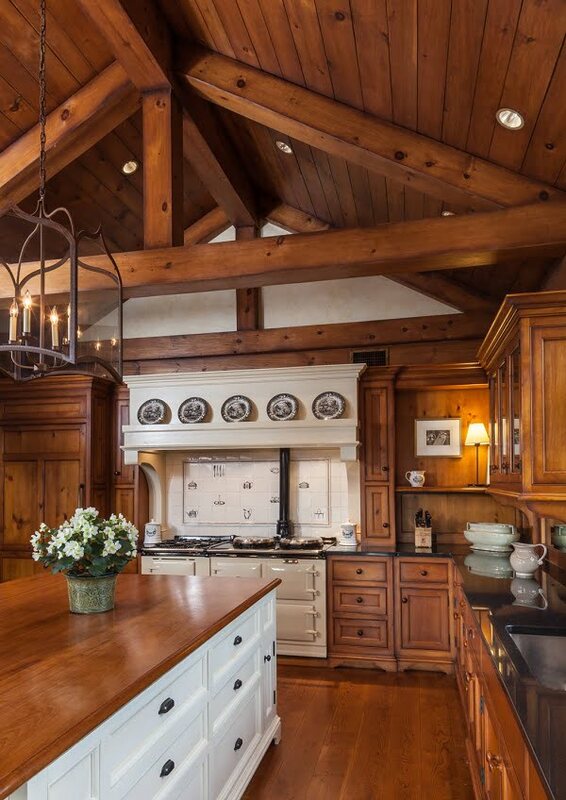 This design is meant to give your kitchen a natural and classic look. 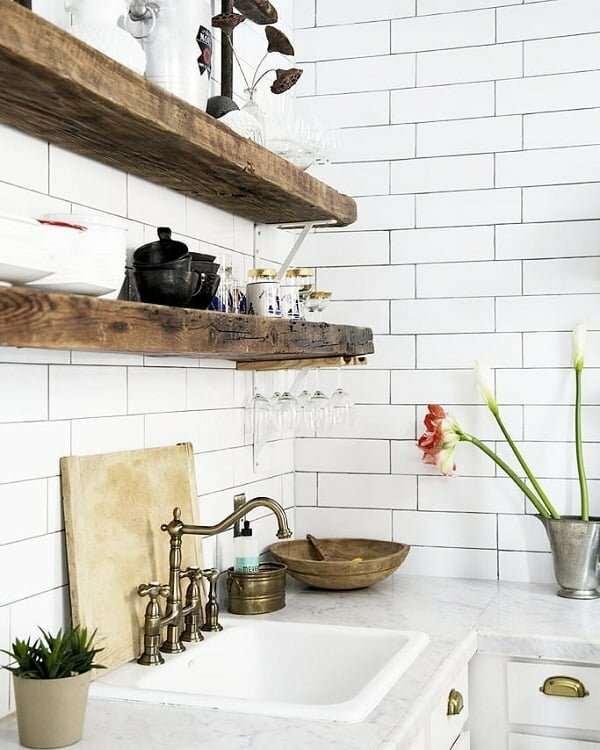 The wooden sink tops are a great addition to the white kitchen cabinets as they make the entire kitchen attractive. 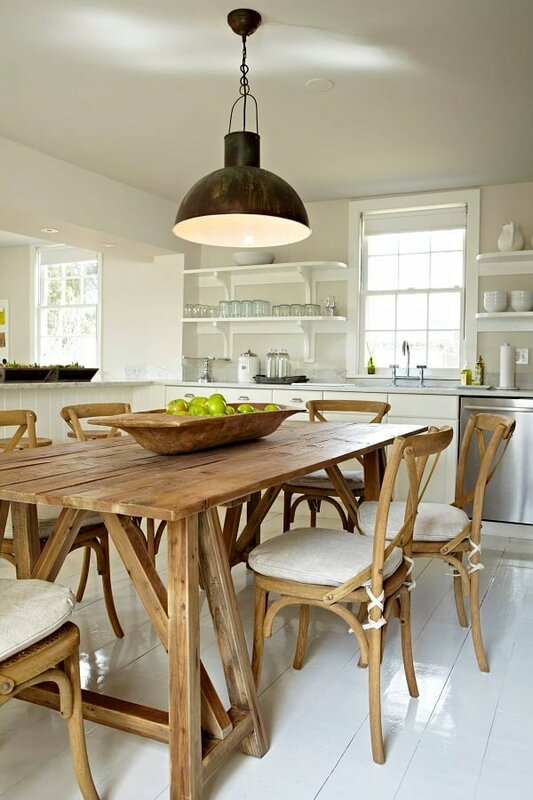 An unpainted dining table with woven seats gives your kitchen a natural look. With a set of yellow flowers, you can brighten up your kitchen. 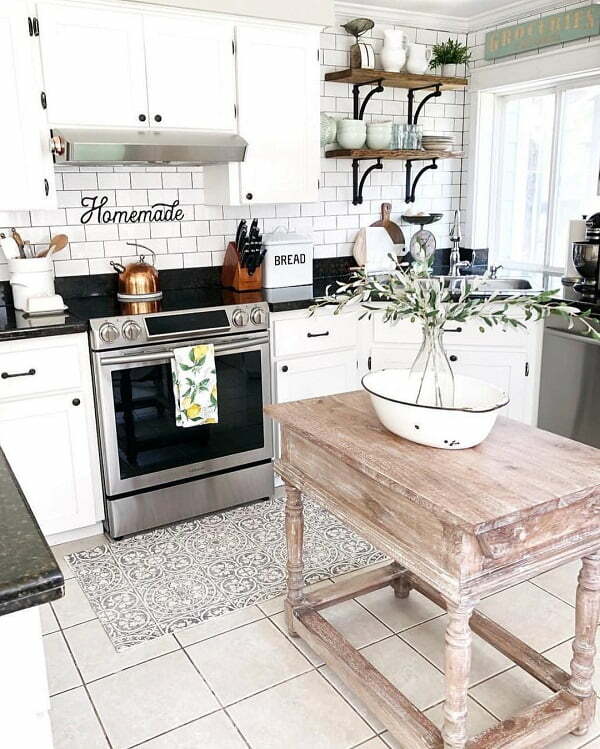 Ideally, this design is meant to give the kitchen a vintage look. 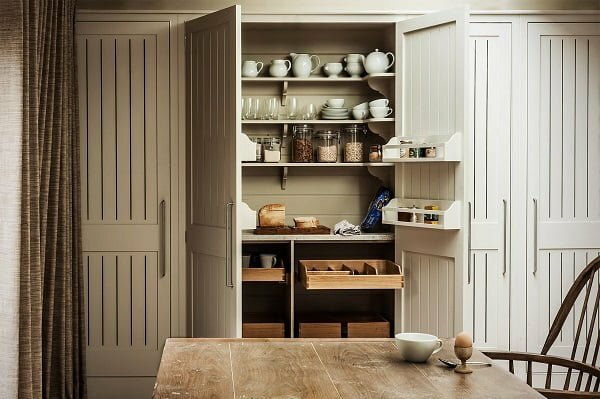 The cupboard is simple with sections for cutlery and ceramic ware. The glass section is to promote viewing of the cupboard details. If you are wondering how to organize your ceramic utensils, a simple grilled metallic shelf is worth considering. The design is to give your kitchen a lively experience. This decor gives the kitchen a fabulous and attractive look. The color has a garden feel, and the approach is farmhouse-like. 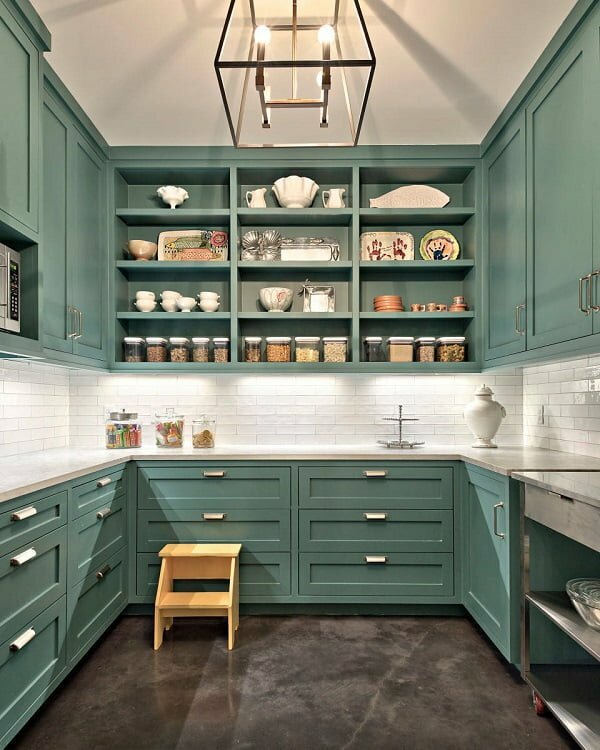 The moody green cabinets are a combination of class and modern design. If you are looking for a classic and an elegant looking kitchen with a beach-touch, the kitchen island table is an ideal option. The whole look is magnificent, especially for the modern kitchen. A mixture of bright and dull colors makes the kitchen unique and stylish. 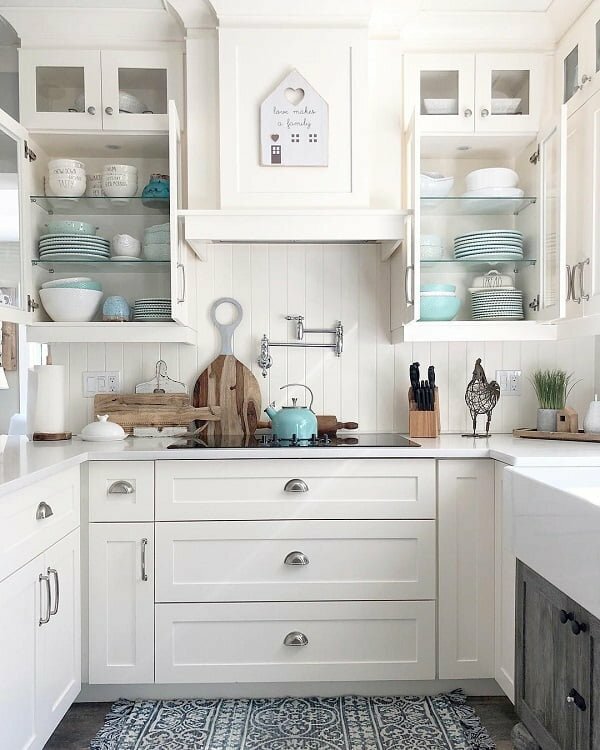 The blue color goes well with the lower cabinets—adjacent to the kitchen sink—and the cream color is for the upper cabinets. This design is meant to brighten the kitchen. 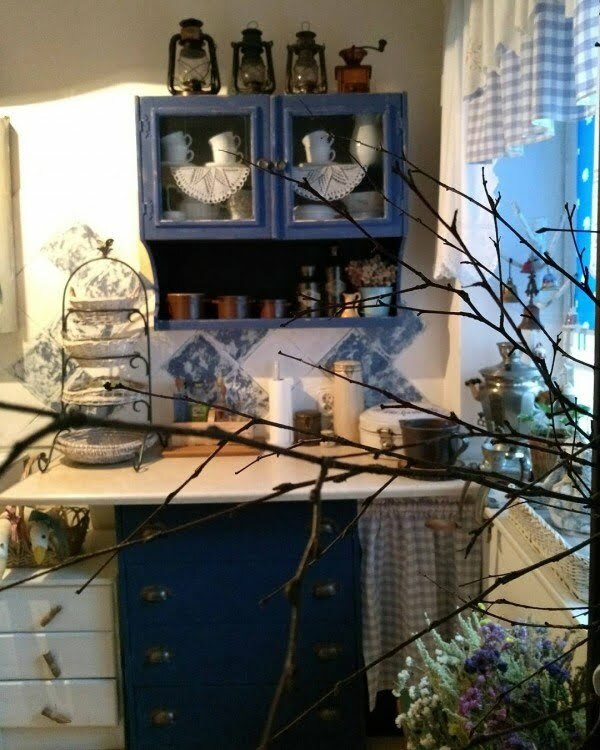 The blue door goes well with white drawers and shelves. The idea is perfect for both the traditional and modern kitchen. 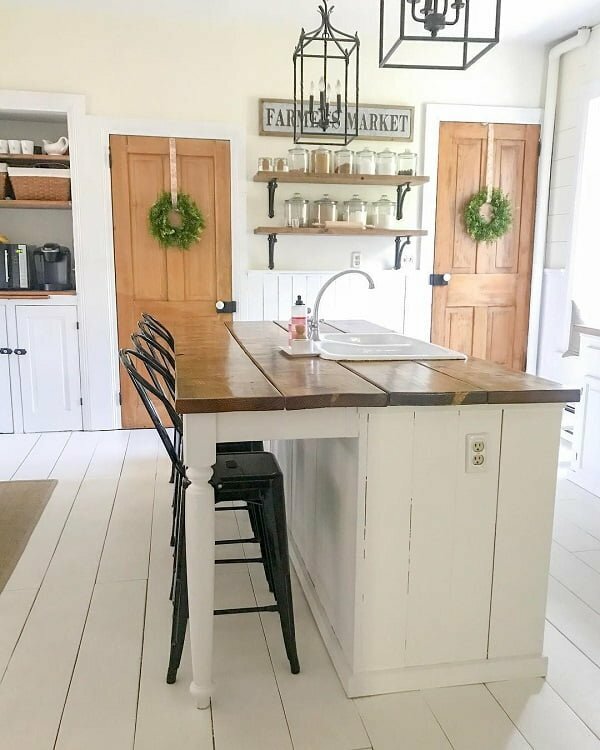 This impressive farmhouse kitchen combines a two-in-one kitchen table and dining room using hardwood and metal elements in perfect synchronicity. 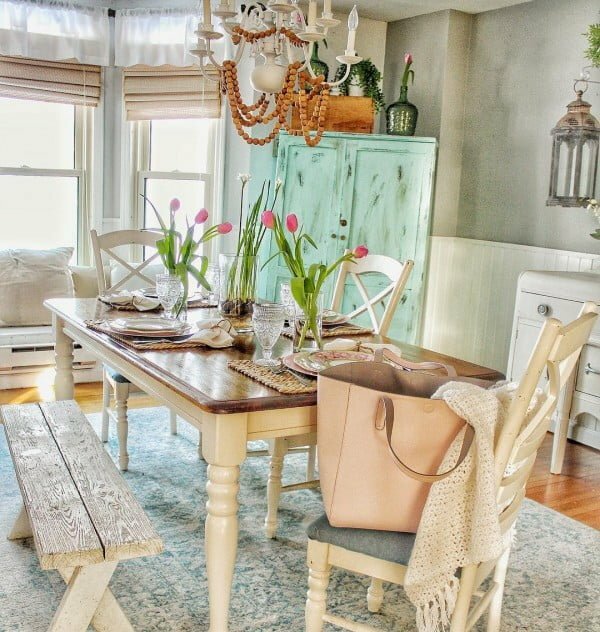 The iron-frame chandelier introduces a middle-age feel into the otherwise blush and neutral kitchen, using modern leather dining room chairs. 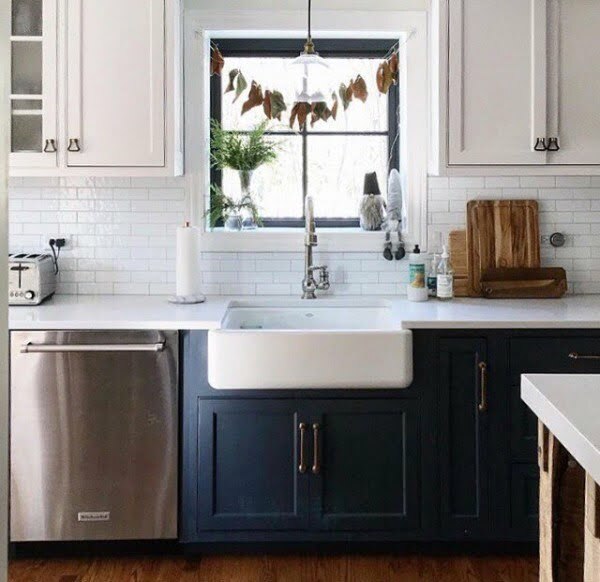 The kitchen’s pleasant ambiance is achieved by incorporating navy-blue kitchen cabinets with white counters, as well as metallic kitchen set details! The dark hardwood kitchen floors and hardwood-marble countertops perfectly contribute to the appeal of the metallic set of dining chairs! 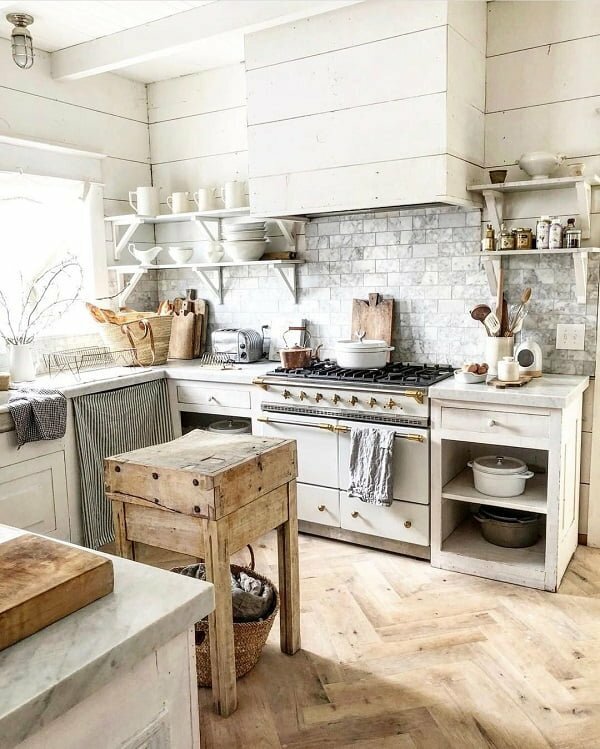 The stunning white tiles wall is contrasted by the hardwood kitchen vent and rustic, silver stove, thus creating a cottage-like atmosphere! 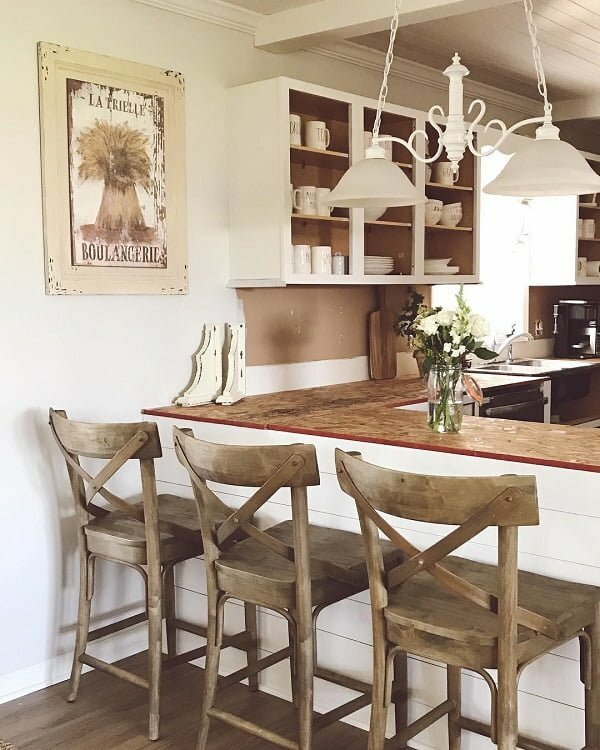 Create a dynamic, yet pleasant kitchen area, by incorporating wall-to-wall beige wood pantry cabinets together with a hardwood dining table and noticeable metallic elements. 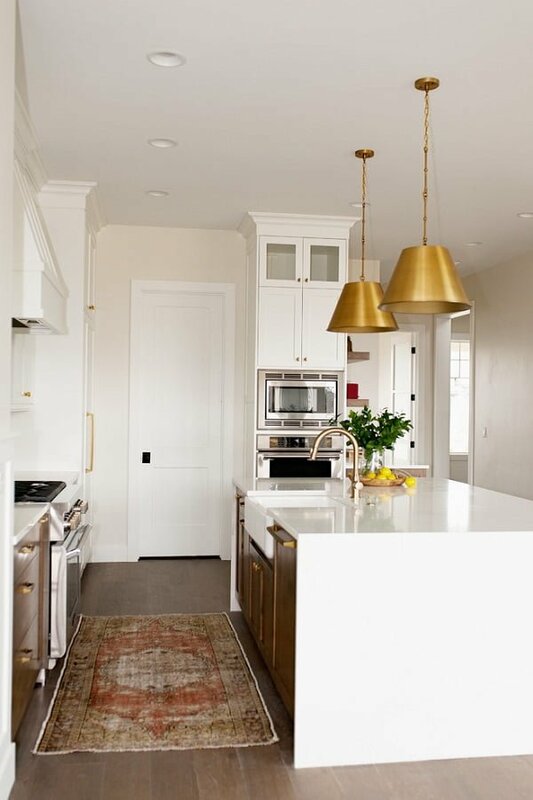 Using a narrower kitchen space to create room and coziness is entirely possible, by micing standardized hardwood kitchen work table with white countertops and captivating gold hanging lights. 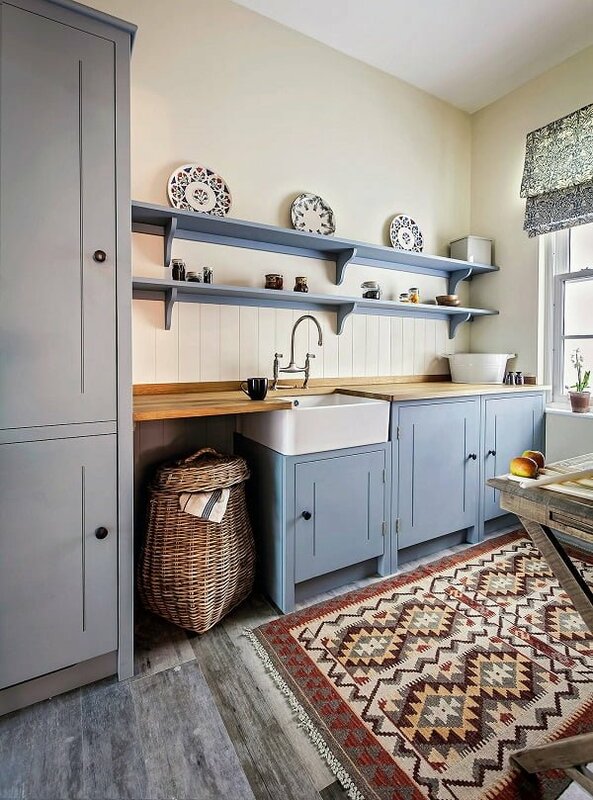 Baby blue tones found in the entire kitchen cabinet set are a perfect match for the Arabic-designed rug and fashionable butler sink with an exposed front! 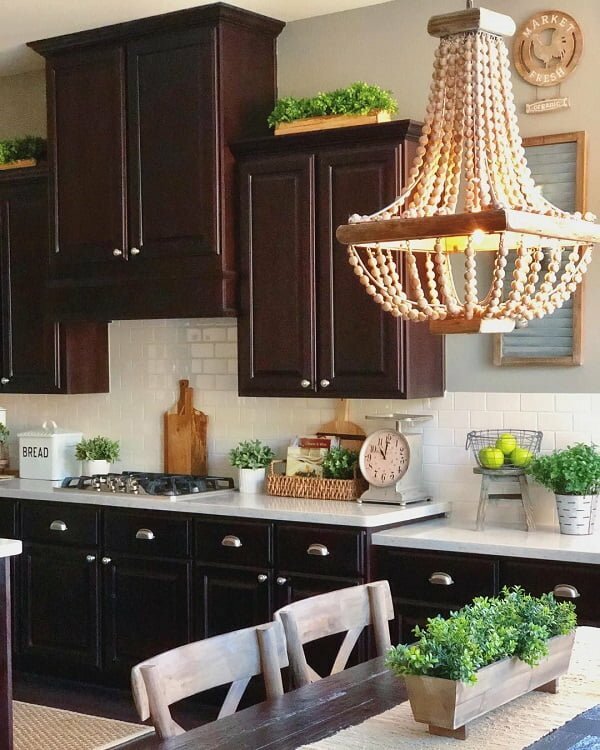 This central kitchen setting is exploding with traditional and contemporary decor bits, such as the statement open-cabinet kitchen table, beautiful dark-green hanging lights, and rustic kitchen cabinets. Transform your kitchen into the ultimate get-together place, by using high bar-like stools and a kitchen-dining combo table. Excellent and functional idea! 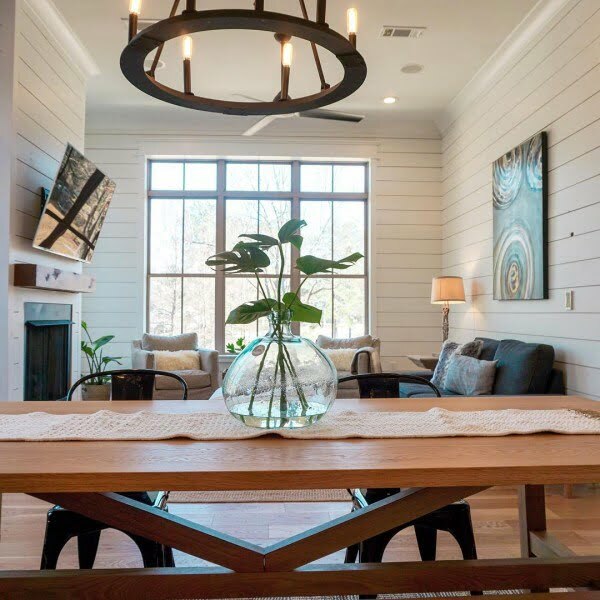 The massive white and brown hardwood kitchen work table also serves as a central dining table, with four all-wood and bar-inspired stools which allow commodity and comfort. 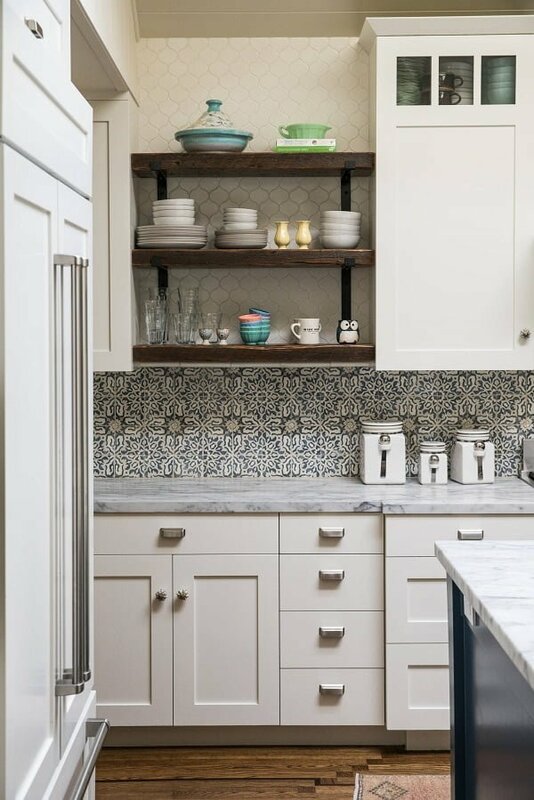 Transform your narrow kitchen space and use oriental pattern walls, soft grey kitchen countertops, and open shelves wall cabinet. It works! 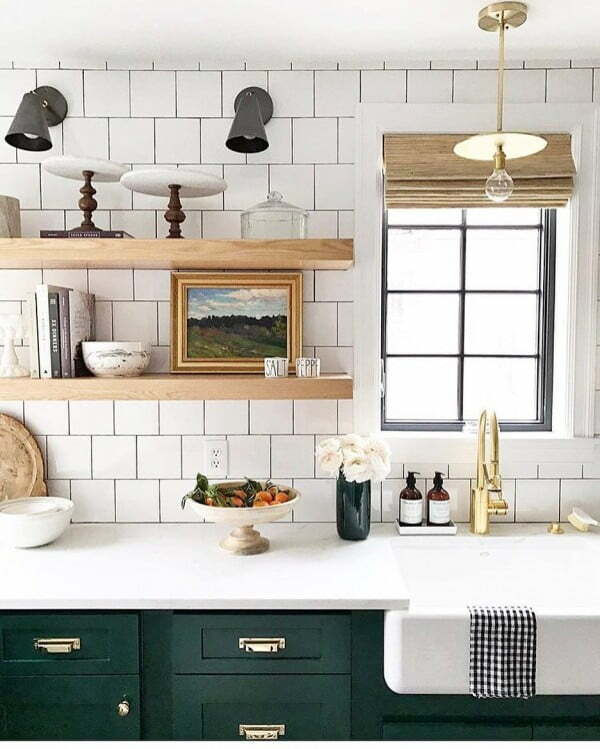 Using three kitchen walls to create a storage paradise, this theme focuses on a neutral green color palette and open-shelves wall cabinets. 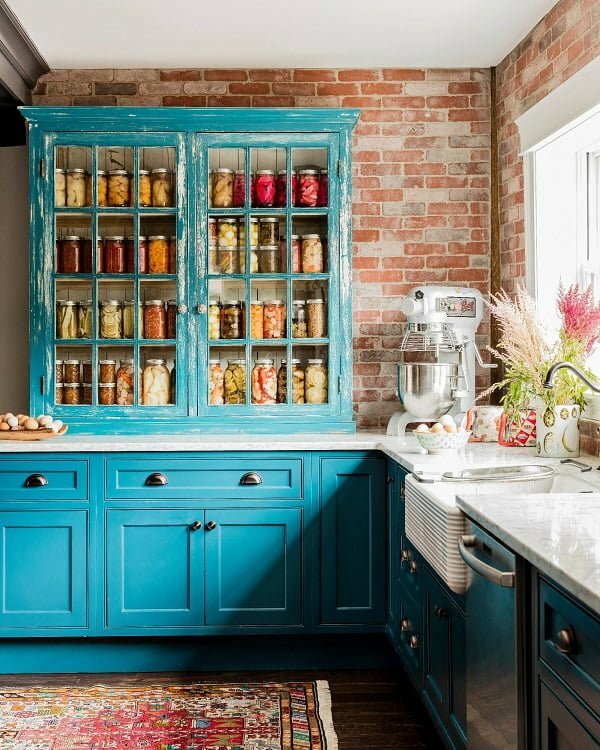 Bright aquamarine tones are more than favorable for the red brick kitchen wall, while the glass door cabinets allow extra light to penetrate the setting. Marvelously composed! 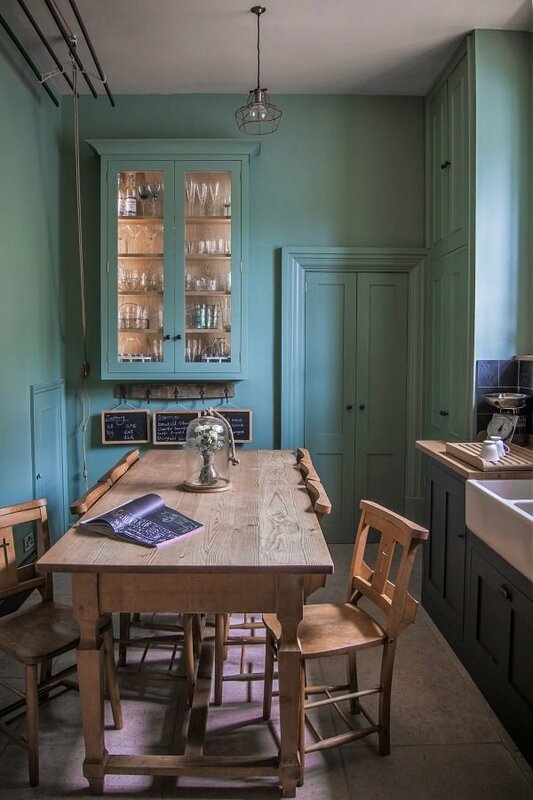 The neutral green cabinets and matching double kitchen door allow plenty of room for the custom-made hardwood dining table with four fitting and handmade wood chairs. 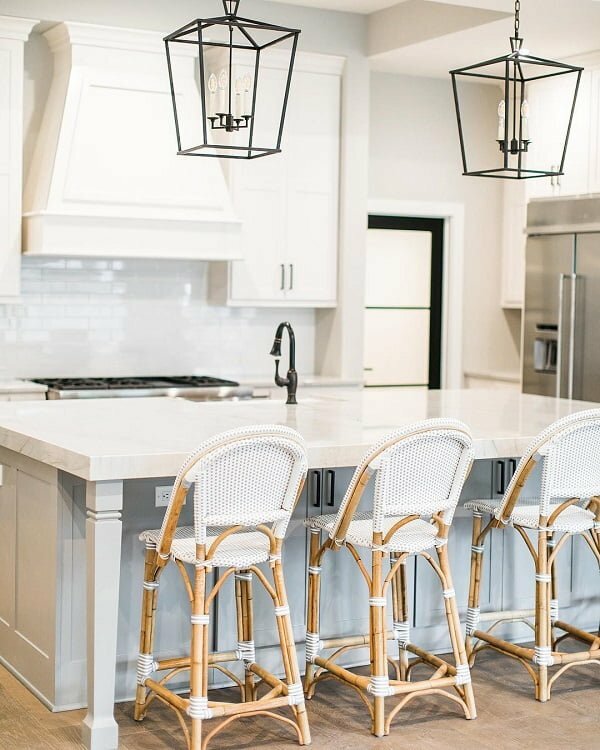 The atypical set of kitchen chairs oozes comfort and usability, enhanced by the large all-white kitchen cabinets and multiple hardwood wall shelves. 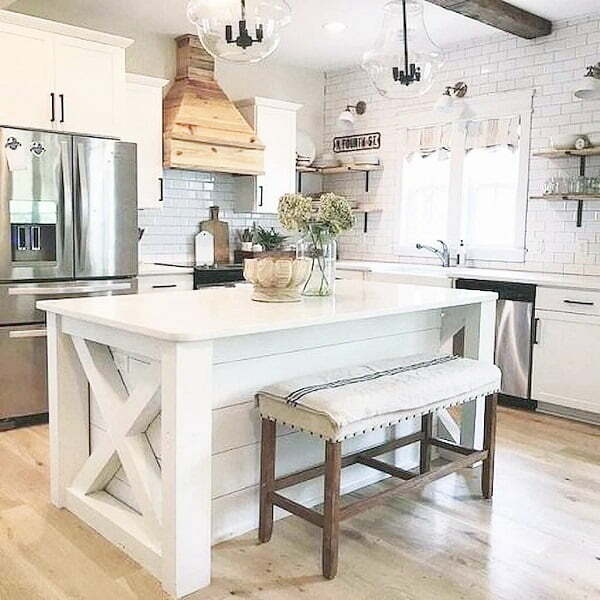 Take a look at this custom-made and barn-inspired dining table set which is an excellent addition to the white kitchen cabinets and refreshing white tile floors. This spacious kitchen presents a central work and dining table combo with high stools and dark hardwood-floors, thus creating a great setting dynamic. This all-wood kitchen uses natural wood elements seen in the cabinets and floors, with the setting being wisely interrupted with popping red elements. 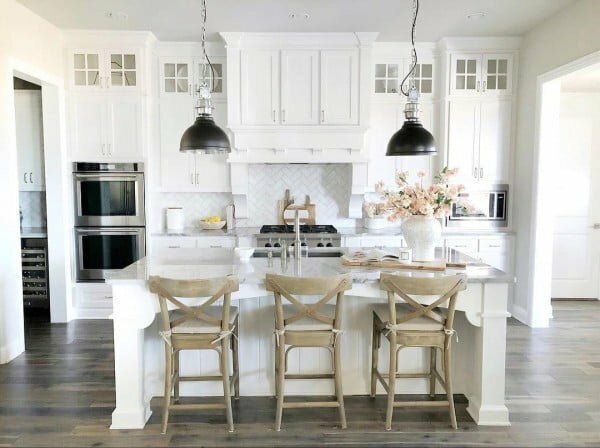 Nothing speaks of perfect kitchen settings like this elegant ambient decorated with all-wood cabinets, walls, and floors emphasized through the white kitchen stove area. 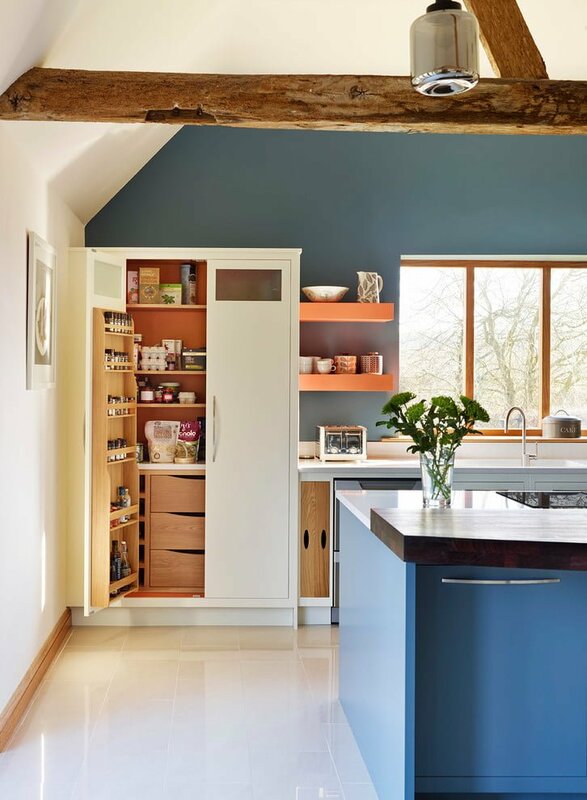 An ingenious example of how using navy-blue walls and kitchen cabinets can create spaciousness, which is also increased through the white and detached pantry and tactical wall shelves. 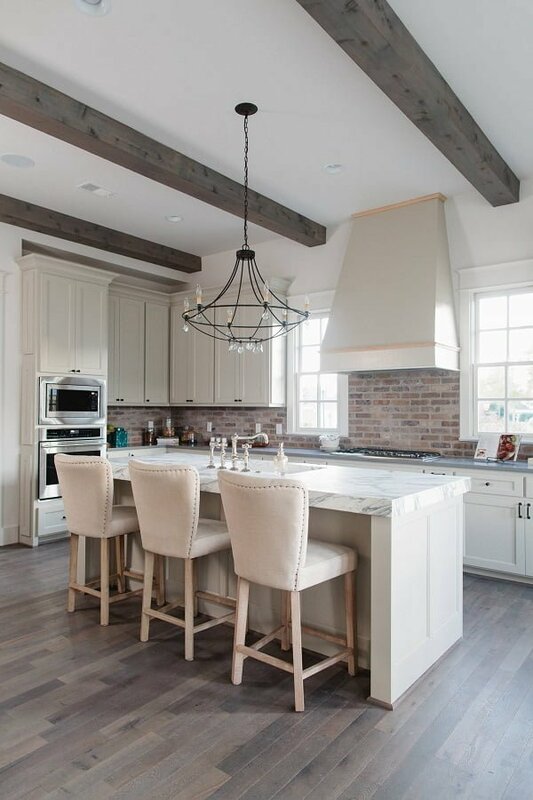 The white tile-brick kitchen walls allow the signature hardwood dining table set to stand out immensely, while also giving the custom-made wood bench a chance to stand out. 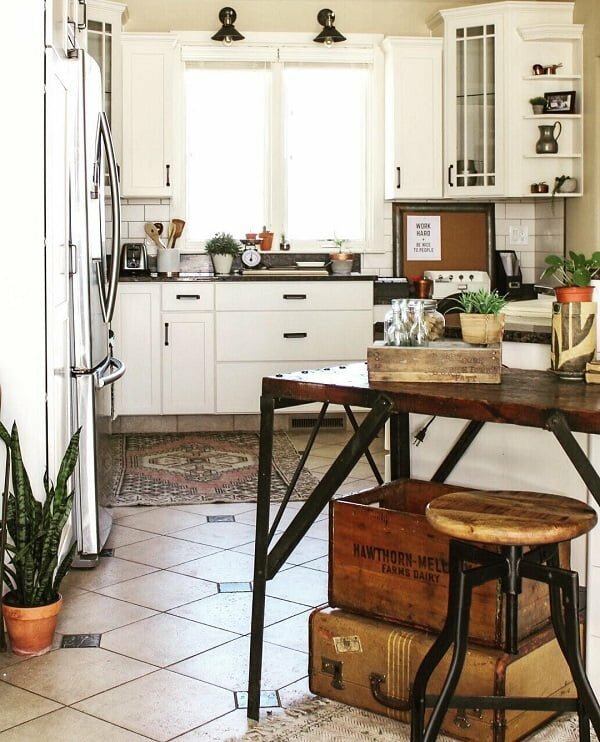 Using a white kitchen counter as a dining table works well in this tiny kitchen space, which is focused on the two handmade bar stools and triple bulb-like lamps. Cozy, yellow kitchen shades are seen in the ceiling, decorative fruit bowls and over-the-cabinet storage baskets, which introduce playfulness and contrast to the white kitchen cabinets and ceiling bars. 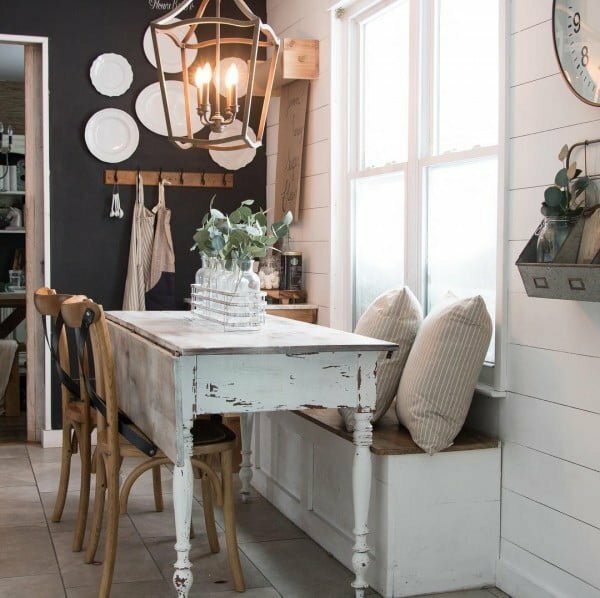 The original hardwood kitchen table offers just enough storage and working space, while the metallic hanging light captures the rustic feel of the kitchen itself. 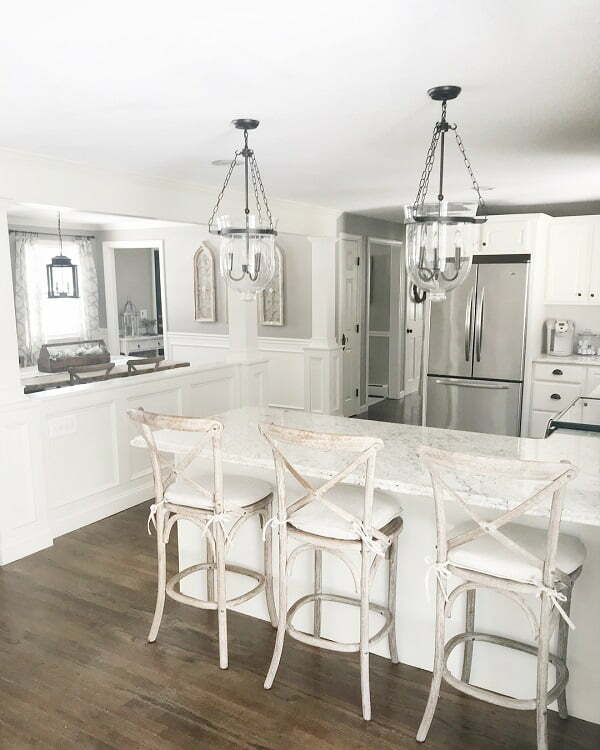 This statement kitchen cabinet has dark grey cabinet doors and fancy patterned marble countertops which match the hardwood floor quite well and emphasize the white hanging cabinet correctly! Introduce vibrancy and boredom-less kitchen ambient by using individual and unevenly placed dark hardwood cabinets which pair the white marble countertops and rustic dining table magnificently! The dark brown cabinets are interrupted by a vast and illuminating outdoor window which gives the white marble countertops deserving attention! 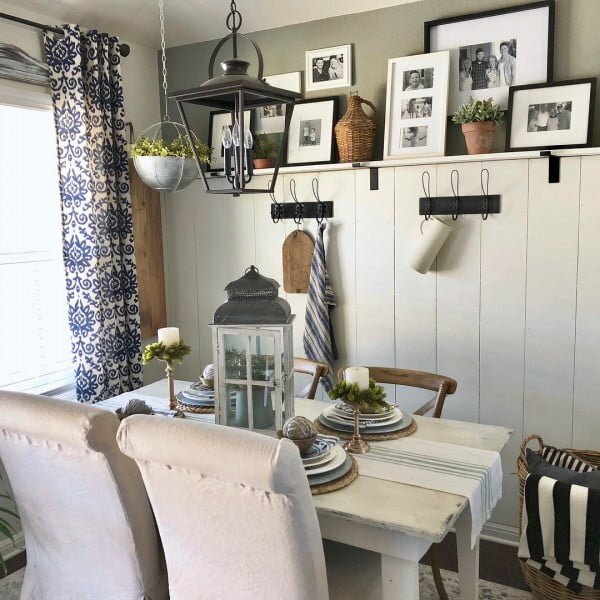 Make the most of your kitchen by combining a hardwood dining table set along with an extra sitting bench that holds wired storage baskets beneath it, and cup and towel hangers above it. 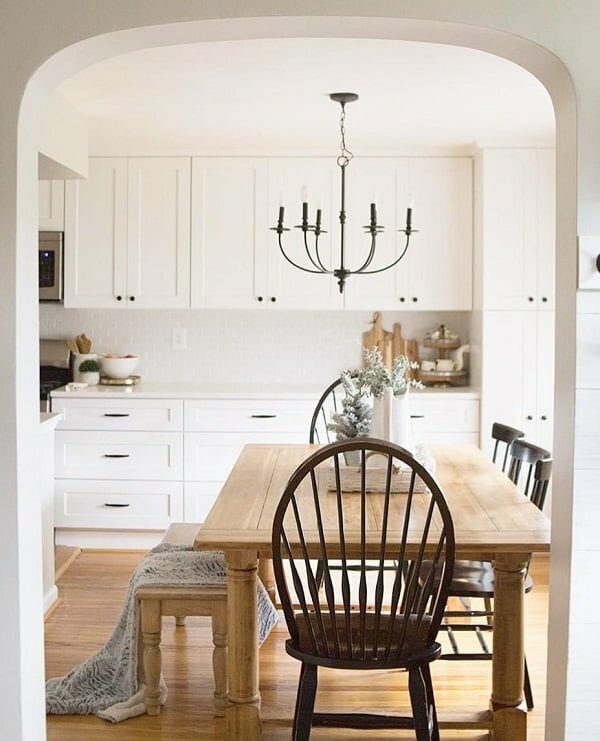 Use long custom-made benches instead of traditional dining room chairs and create a pleasant kitchen setting, based on large G-shaped cabinets and an elegant chandelier. 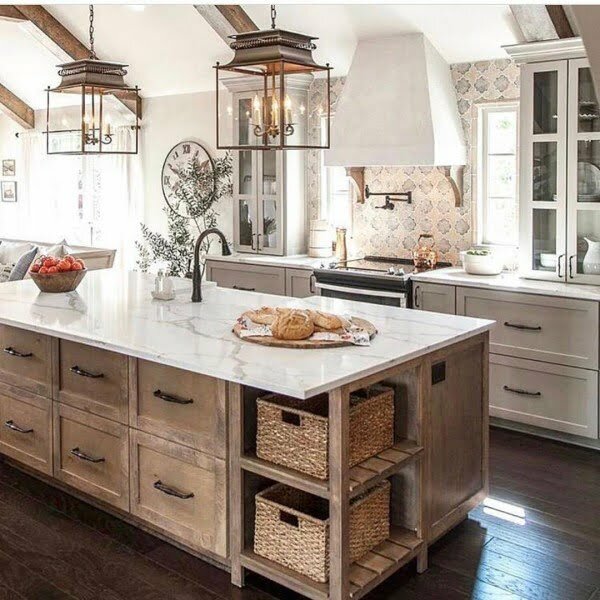 This magnificent kitchen mixes plenty of patterns and textures, including refreshing barstools, all white walls and kitchen appliances as well as middle-age iron chandeliers, thus creating a heavenly setting. 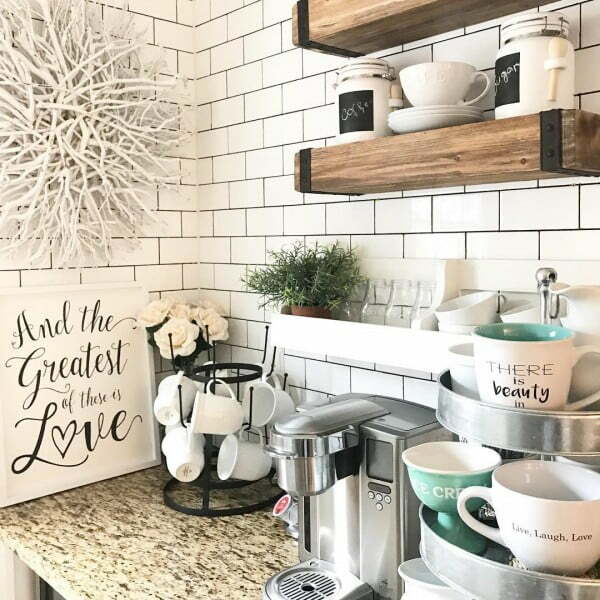 This extraordinary kitchen shelf corner includes white brick walls, extended and fitting wood shelves, and precious porcelain kitchenware, reflecting a nostalgic kitchen scenery. The rich-looking hardwood dining table speaks of glamour unlike anything else, enriched with the strategically placed pub lamps and retro glassdoor cabinet. 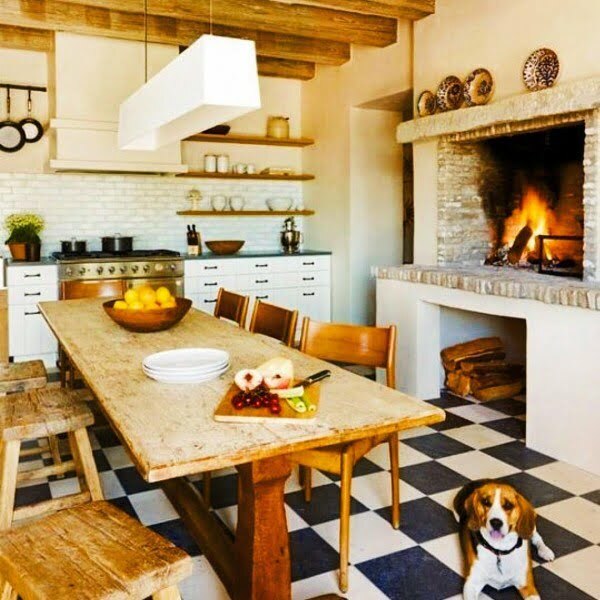 A spectacular kitchen design using white tile floors, a smaller work table and light cabinets with dark doorknobs which add a pop of color to the white noise! The kitchen is focused on the handmade hardwood cabinet which exudes retro vibes along with the open wall shelves and strategic cup hangers. Combining a kitchen work table and a dining room table into one is more than smart. Combine modern barstools and middle-age chandeliers to create an almost fictional ambient. 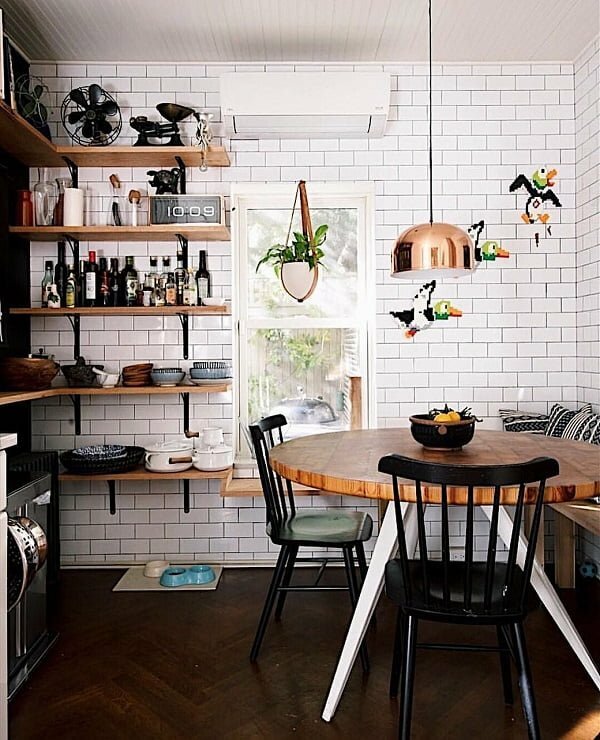 The white brick walls encapture a modern, yet timely vibe in the kitchen, with the open shelf, set creating a high contrast in both material and texture. 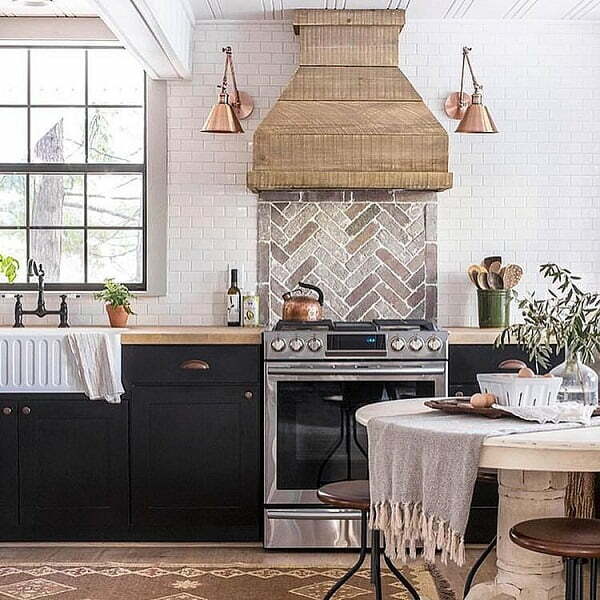 From the zig-zag brick stove wall to the tiny white brick walls and deep black cabinets, this kitchen space explodes with a particular taste for interior design. Pastel grey countertops are a charming addition to the white side cabinets divided by open wall shelves, thus opening up space significantly. 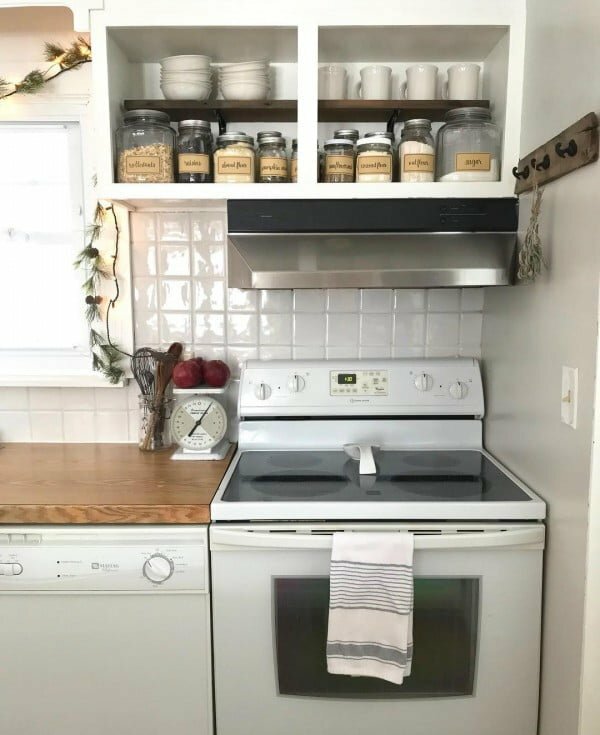 Go back in time and create a super-flattering kitchen using an old-model stove, a tiny single table, and corner adaptable shelves. 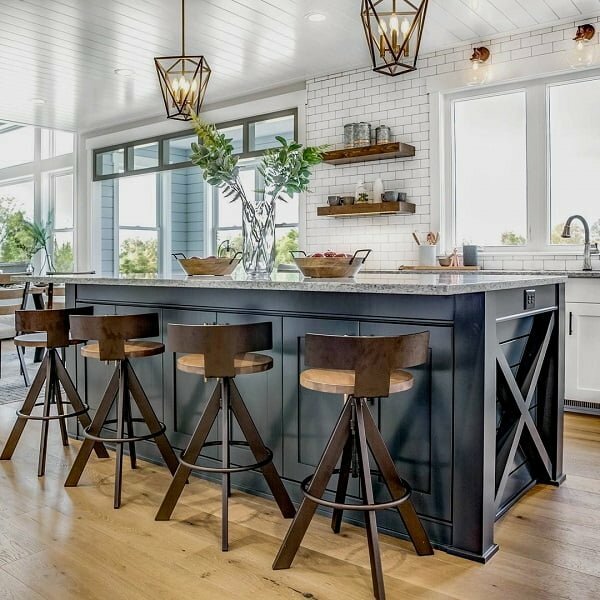 A bold approach to a kitchen setting, recreating a real-life bar feels, by using a round hardwood table, black hardwood chairs, and dark parquet floor. Just right! 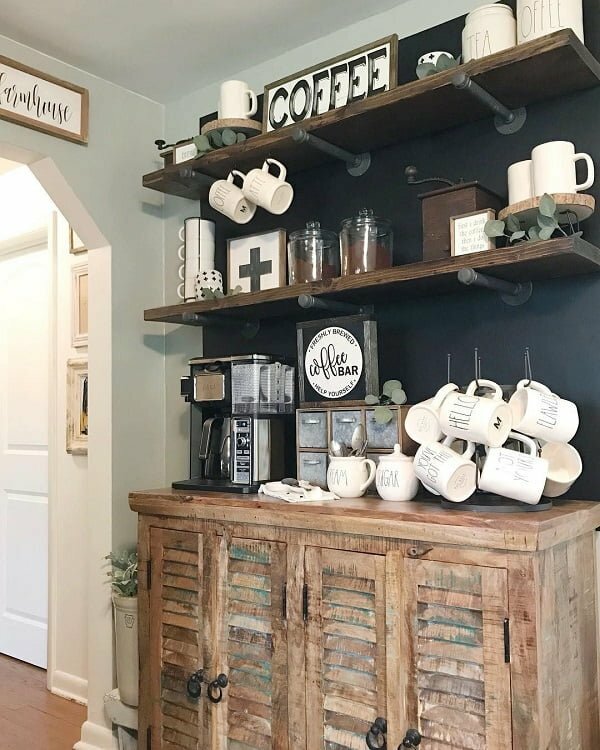 The old-hospital wall decorated with white square tiles halfway up is creating a magnetizing corner composed of a handmade wood-iron shelf and exciting cup hangers beneath it. The vast kitchen room uses a central sink table with beige marble countertop as well as open black cabinets and an all-tile floor. 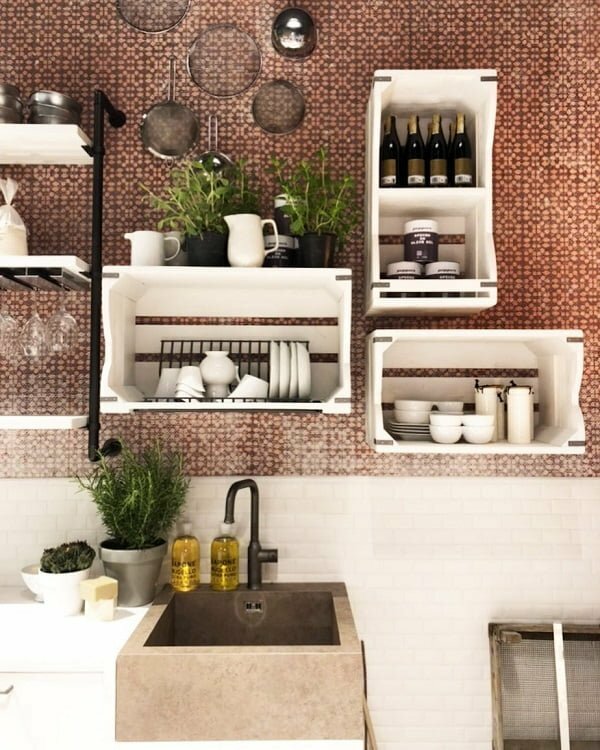 A genius kitchen idea which focuses on red print walls, box-like storage shelves and rectangular brown sink which is a statement piece in the setting itself. 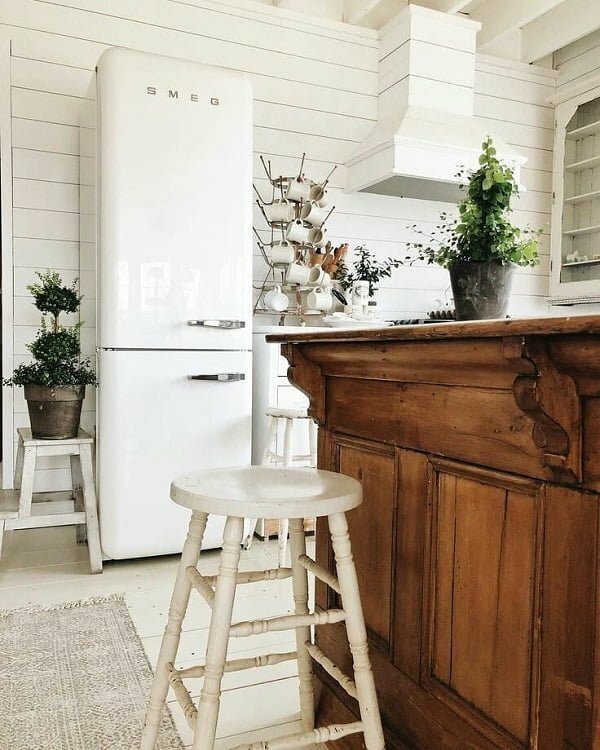 All it takes is one white barstool, a retro white fridge and an office desk-inspired kitchen table to create a desirable and appealing kitchen setting made for enjoyment! 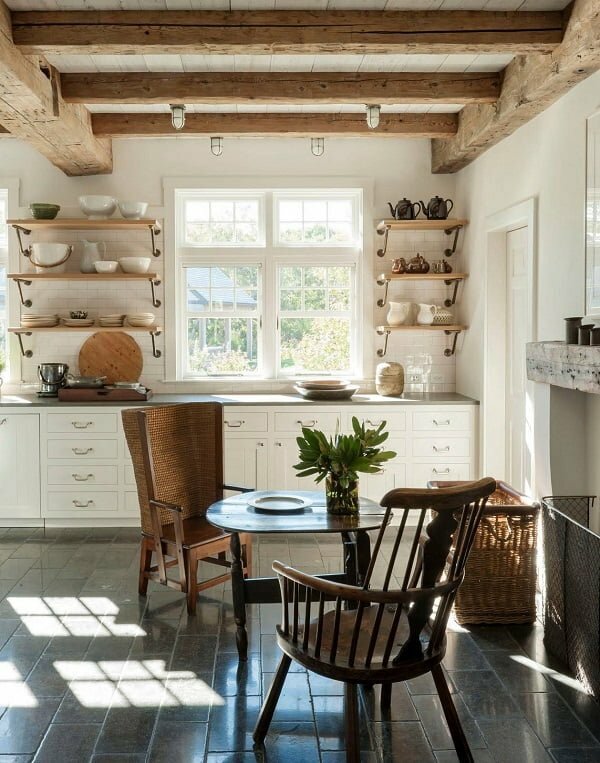 The kitchen uses all white walls and appliances to open up the space more, with a central barn-like table taking up only the necessary space, leaving enough room for mobility. 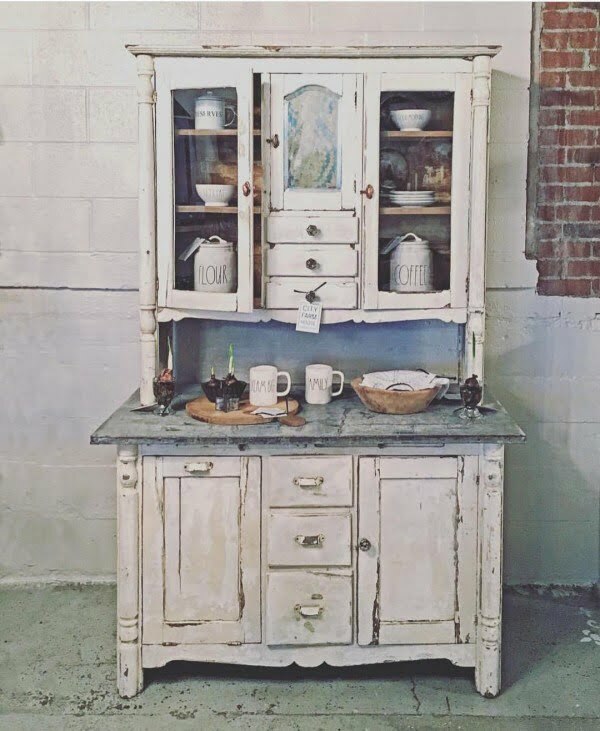 The rustic, brush-painted white cabinet is a staggering piece in the kitchen and is synchronized with the dark hardwood table and oval iron chandelier! 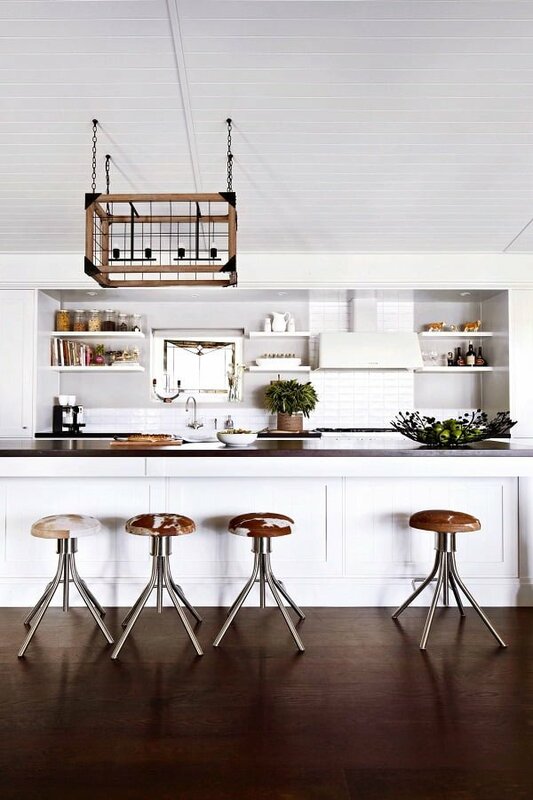 A unique approach to a kitchen setting comprised of a half-dining-half-work kitchen table with cool barstools and iron lantern-like lamps. 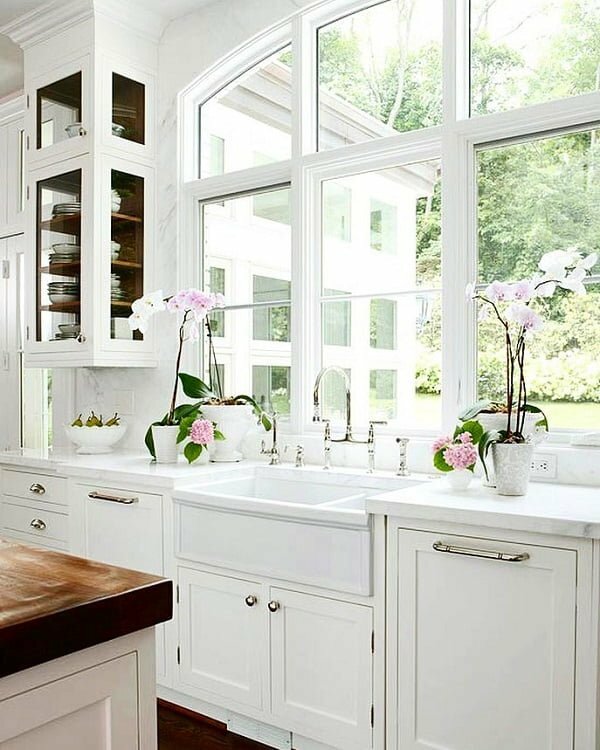 Have a look at this majestic kitchen, composed of a central cut-up window, white cabinets with golden doorknobs and exposed column shelf cabinet! Isn’t it outstanding! 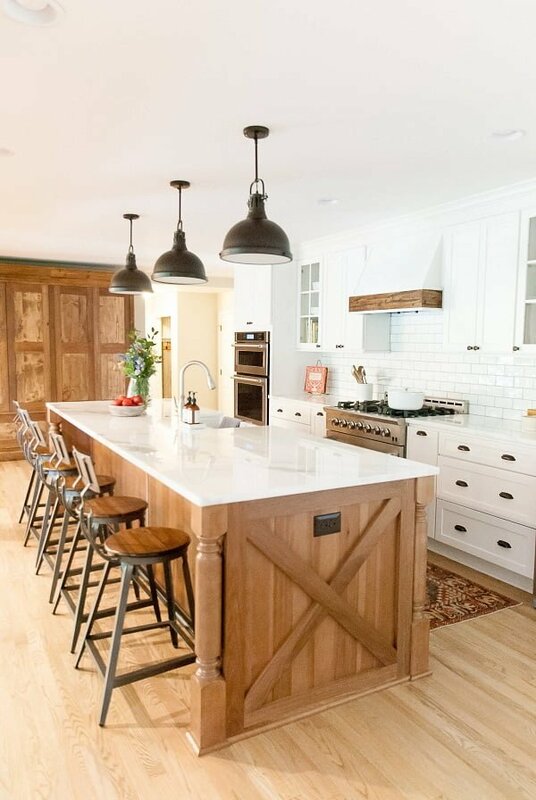 This sophisticated and nostalgic kitchen is composed of a barn-inspired mini table, white plank half-walls, and white and gold kitchen appliances. Gorgeous! This extravagant kitchen setting is keeping the focus on the marvelous hardwood-iron table while reflecting the silver kitchen appliances and bar-like ceiling lamps. 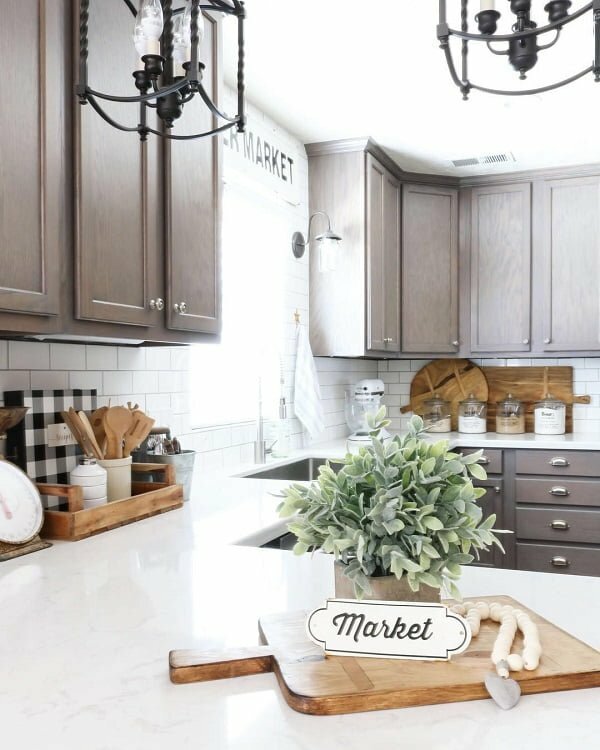 The countertops and walls of the kitchen are pure fist grey marble, which is an excellent pair for the simplistic wall hangers and light hardwood cabinets. 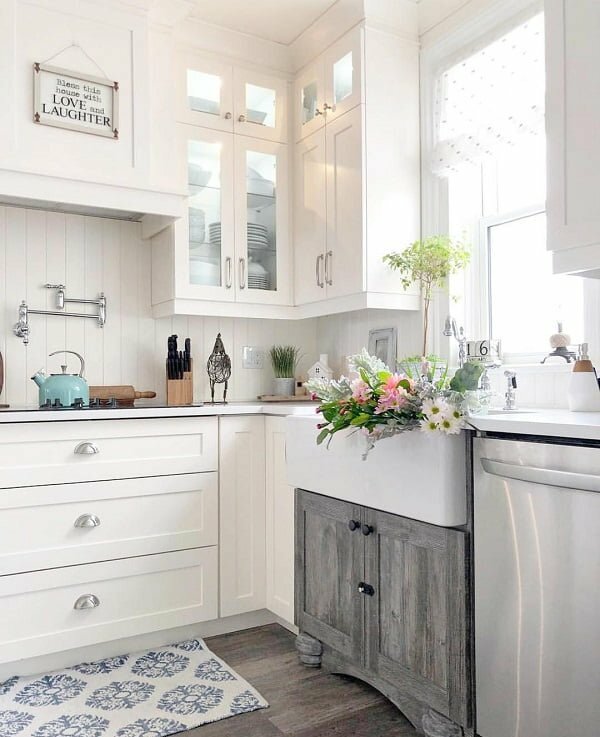 This fantastic kitchen space uses soft pastel colors noticed in the kitchen bar set and the various floral arrangements which also introduce softness to the room. 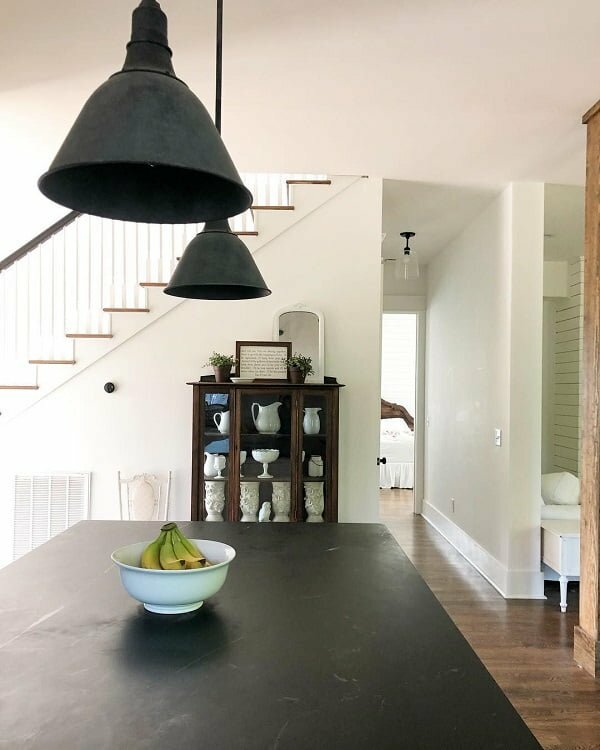 The open-hallways kitchen is focused on neutral colors, seen in the soft hardwood kitchen table, the ivory cabinets and the warm hardwood floor. 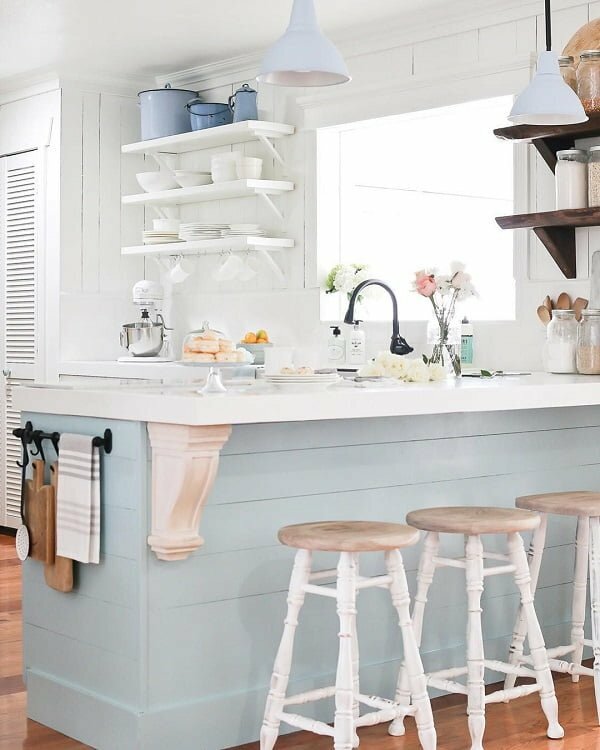 A white kitchen paradise can be achieved by introducing matching wood and glassdoor cabinets and showing just a hint of color through the pale blue dishes. A focal kitchen setting which interconnects to the garden and the rest of the house and allows room through the trendy kitchen table and fitting silver kitchen appliances pressed against the wall. 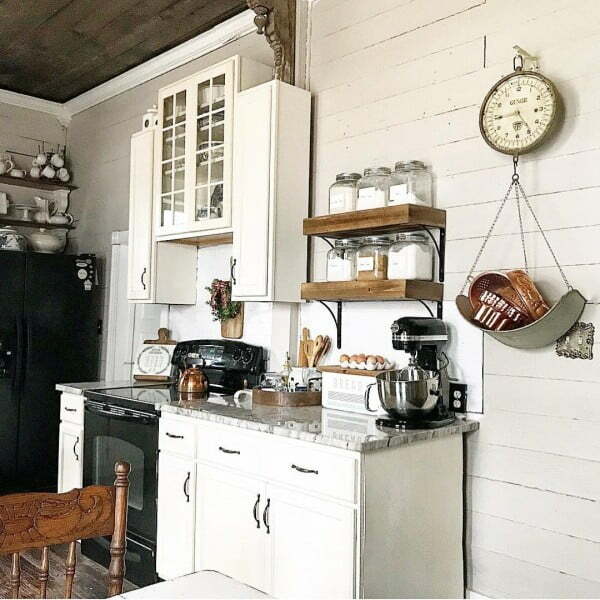 The freshness and cleanliness of this kitchen corner are represented by the old-fashioned stove, the stone wall which also serves as a hanger, and the enticing floral arrangements. 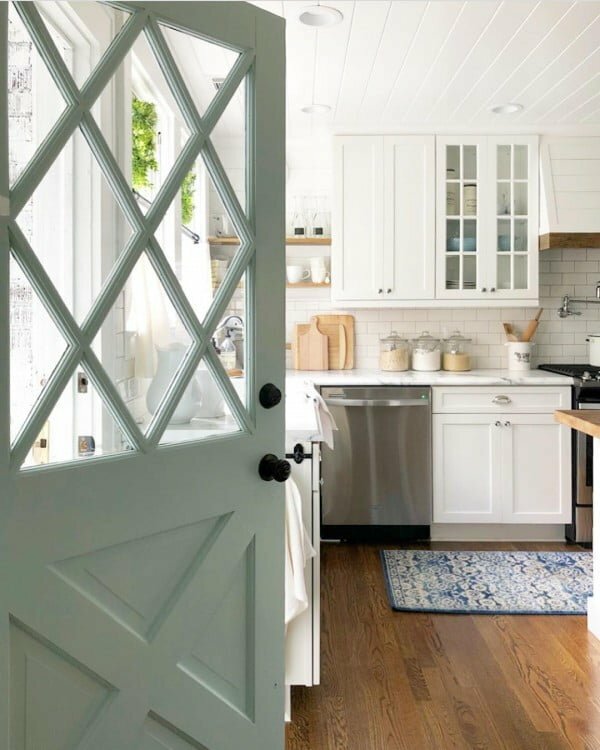 Exude positivity and good vibes by decorating your kitchen with white glass door cabinets and a butler sink laying over another rustic and grey cabinet. If you are searching for comfort and usability, this kitchen space is just for you! 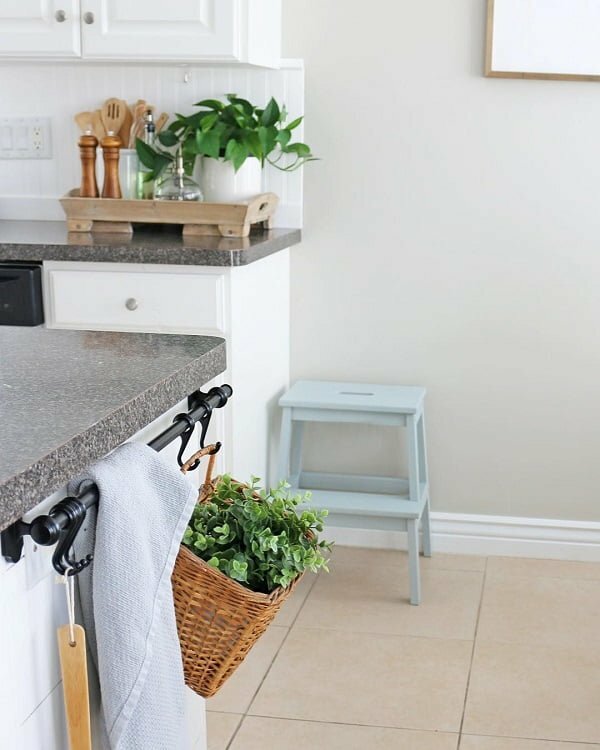 Space is accentuating the dark grey kitchen countertops, white walls, and an installed iron hanger. Yes! 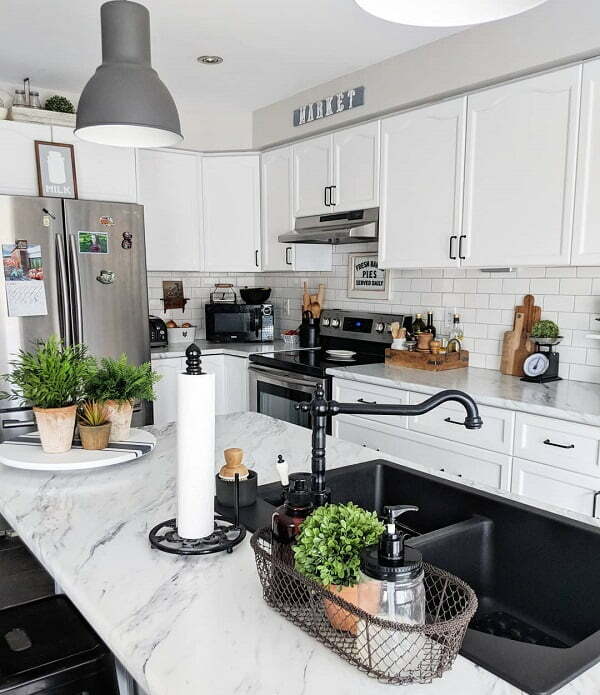 This inviting kitchen setting explodes with versatility – from the stainless black faucet to the pale marble countertops and minimalistic cabinets – it is a joy to behold! 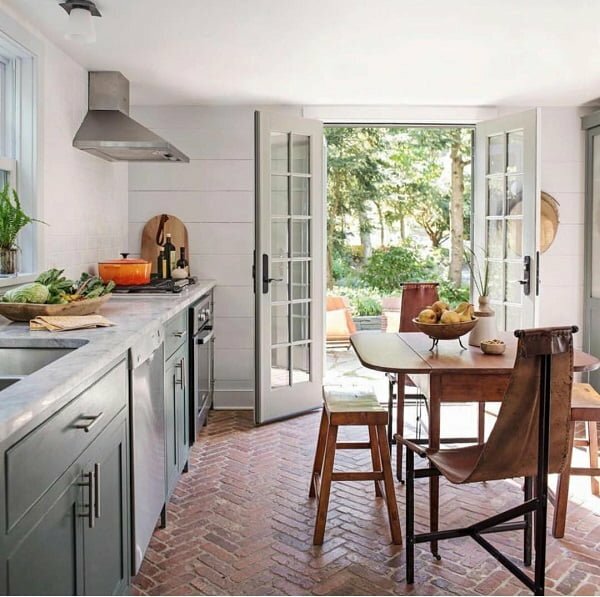 The pale blue kitchen cabinets extend from wall to wall, thus allowing the hardwood table to grab the attention along with the central outdoor window. Everything in this kitchen, from the cream countertops to the compact kitchen table and white cabinets, screams of minimalistic sensation! 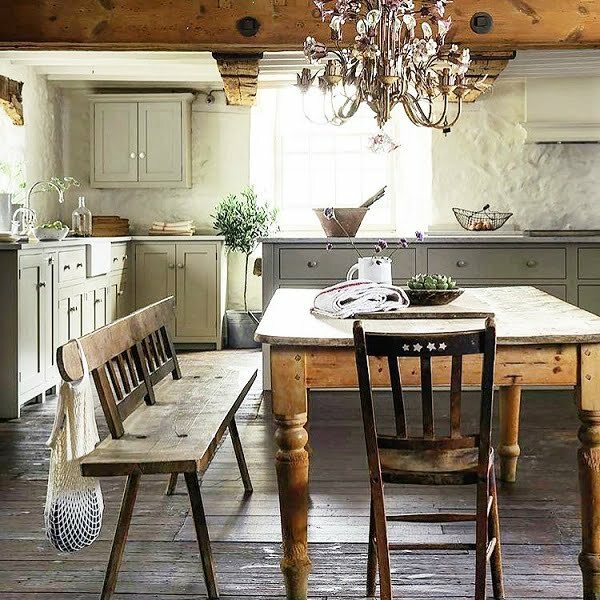 The rustic barstools enable the kitchen to use the central white table as a working and dining area, extraordinarily accentuated with two clear hanging lights. The G-shaped kitchen bar is smartly dividing the cooking area from the dining room corner, enhanced by the ultra-retro chairs and joint white chandelier. 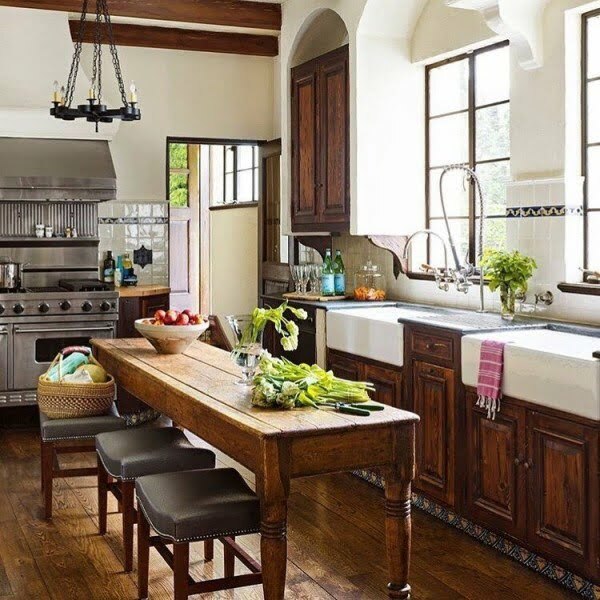 A traditional kitchen outlook, offering plenty of unusual textures and elements, such as the barn-inspired central table with built-in sink and cabinets, as well as the massive wood-structured chandelier.